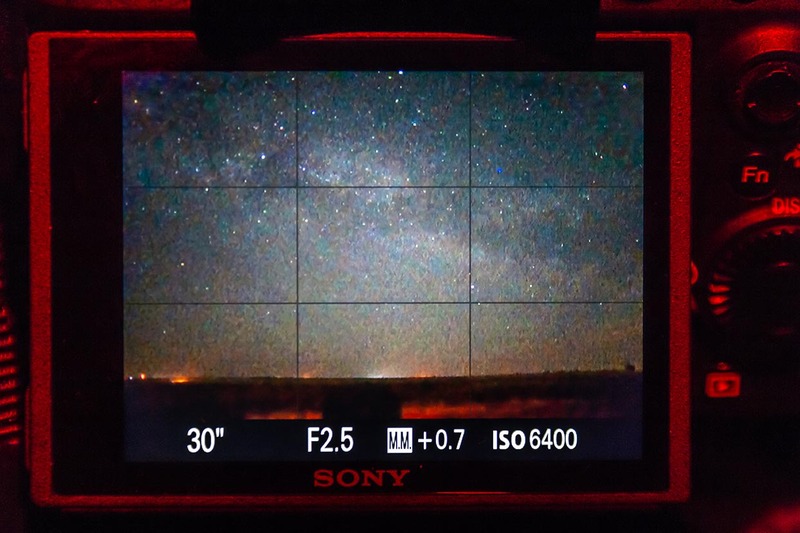 I put the new Sony a7III mirrorless camera through its paces for the features and functions we need to shoot the night sky. Sony’s a7III camera has enjoyed rave reviews since its introduction earlier in 2018. Most tests focus on its superb auto exposure and auto focus capabilities that rival much more costly cameras, including Sony’s own a7rIII and a9. For astrophotography, none of those auto functions are of any value. We shoot everything on manual. Indeed, the ease of manually focusing in Live View is a key function. In my testing I compared the Sony a7III to two competitive DSLRs, the Canon 6D MkII and Nikon D750. All three are “entry-level” full-frame cameras, with 24 to 26 megapixels and in a similar price league of $1,500 (Nikon) to 2,000 (Sony). I tested a Sony a7III purchased locally. It was not supplied to me by Sony in return for an “influential” blog post. 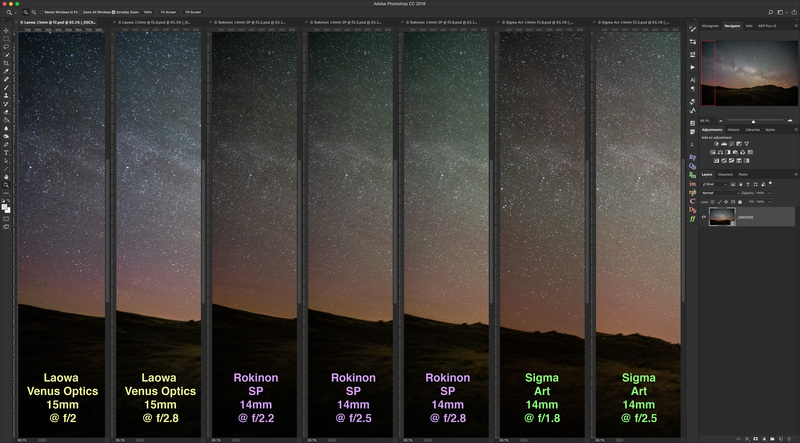 I did this testing in preparation for the new third edition of my Nightscapes and Time-Lapse eBook, which includes information on Sony mirrorless cameras, as well as many, many other updates and additions! NOTE: Click or Tap on most images to bring them up full-frame for inspection. MILKY WAY AT DINOSAUR PARK A stack of 2 x 90-second exposures for the ground, to smooth noise, and at f/2.8 for better depth of field, plus a single 30-second untracked exposure at f/2 for the sky. All with the Laowa 15mm lens and Sony a7III at ISO 3200. The Sony a7III with the compact but fast Laowa Venus Optics 15mm f/2 lens. 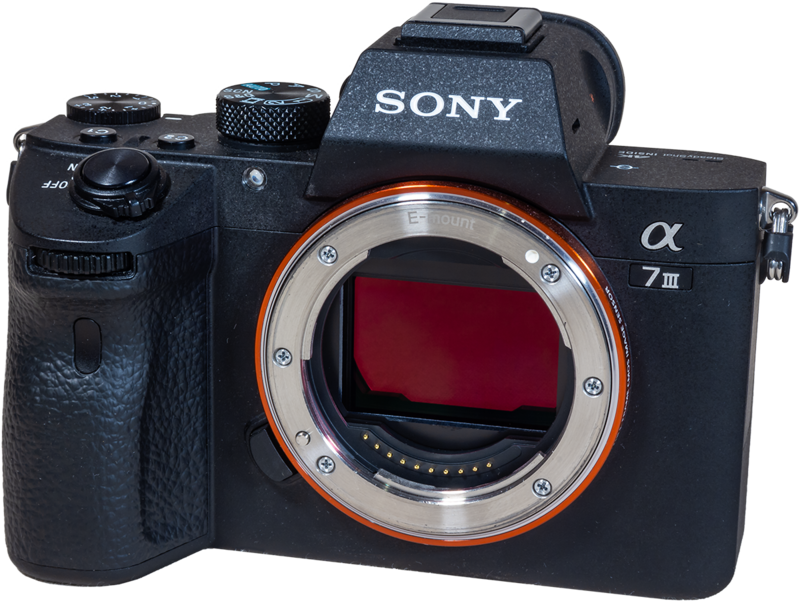 As with Sony’s other popular Alpha 7 and 9 series cameras, the new Alpha 7III is a full-frame mirrorless camera, a class of camera Canon and Nikon have yet to offer, though models are rumoured or promised. In the meantime, Sony commands the full-frame mirrorless market. As its name implies, a mirrorless camera lacks the reflex mirror of a digital single lens reflex camera that, in a DSLR, provides the light path for framing the scene though the optical viewfinder. The Sony a7III’s excellent Live View screen display. You can see the Milky Way! In a mirrorless, the camera remains in “live view” all the time, with the sensor always feeding a live image to either or both the rear LCD screen and electronic viewfinder (EVF). While you can look through and frame using the EVF as you would with a DSLR, you are looking at an electronic image from the sensor, not an optical image from the lens. The advantage of purely electronic viewing is that the image you are previewing matches the image you’ll capture, at least for short exposures. The disadvantage is that full-time live view draws more power, with mirrorless cameras notorious for being battery hungry. Compact size and lighter weight, yet offering all the image quality of a full-frame DSLR. 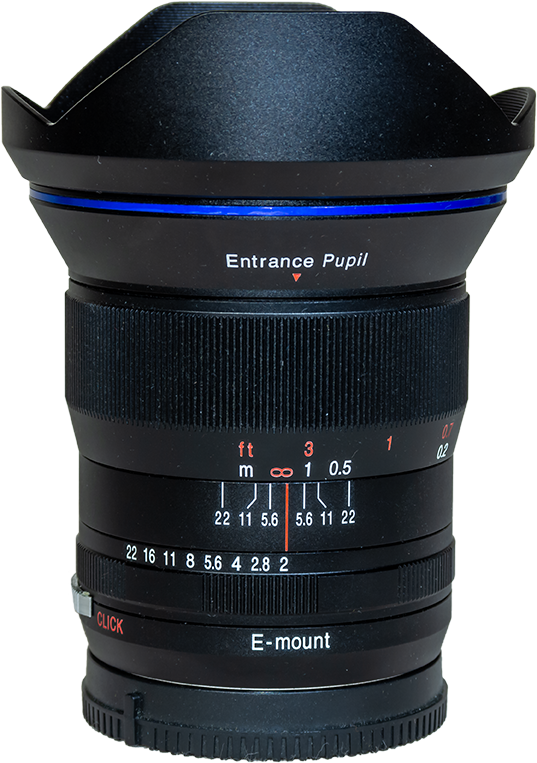 The thinner body allows the use of lenses from any manufacturer, albeit requiring the right adapter, an additional expense. 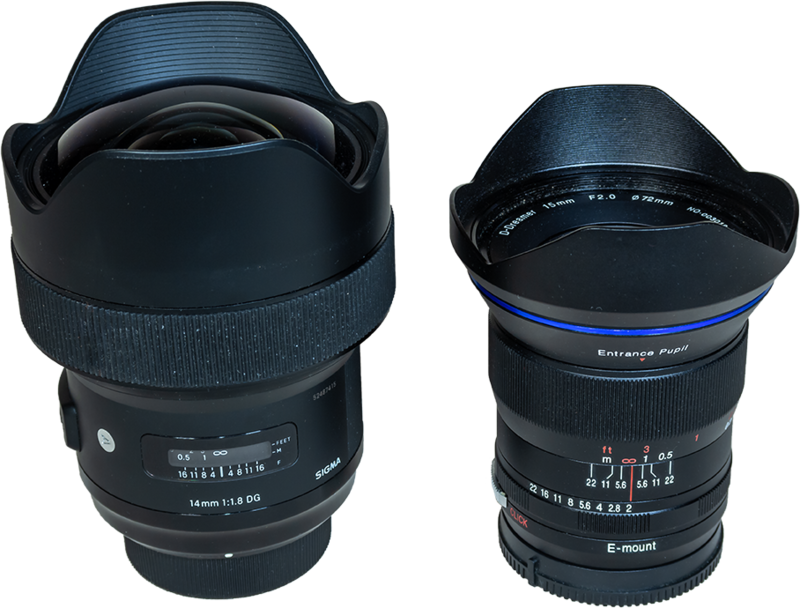 Lenses developed natively for mirrorless models can be smaller and lighter. 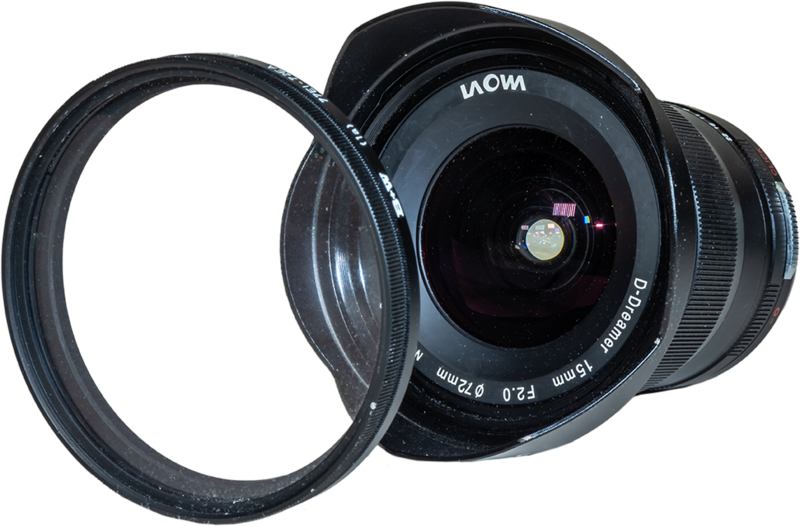 An example is the Laowa 15mm f/2 I used for some of the testing. The design lends itself to video shooting, with many mirrorless cameras offering 4K as standard, while often in DSLRs only high-end models do. More rapid-fire burst modes and quieter shutters are a plus for action and wedding photographers, though they are of limited value for astrophotography. The Sony a7III, Nikon D750, and Canon 6D Mark II. Note the size difference. The North America Nebula with the Sony a7III and a Meade 70mm f/5 astrographic refractor, for a single 4-minute exposure at ISO 1600. The reds have been boosted in processing. 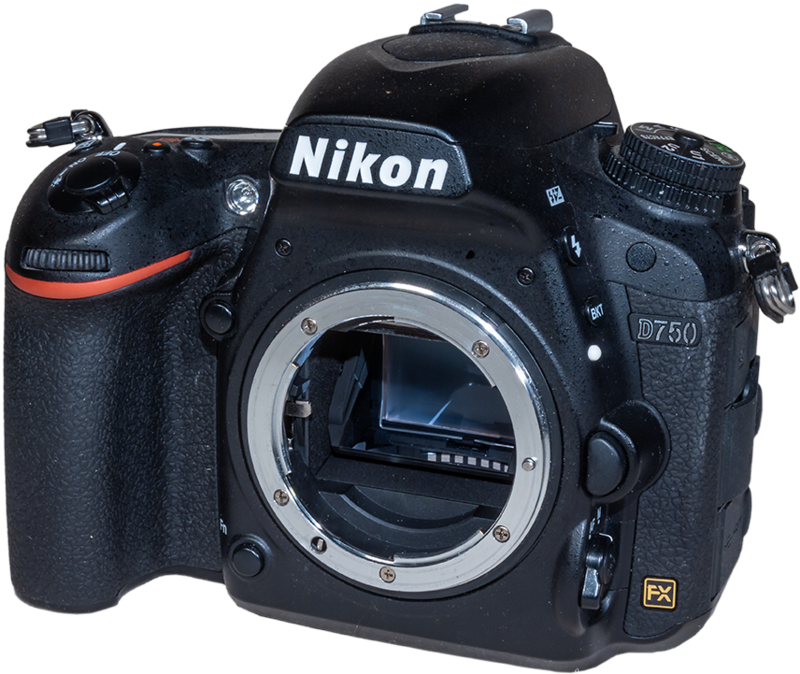 Levels of luminance and chrominance noise were excellent and similar to – but surprisingly not better than – the Nikon D750. The Star Eater is gone. Stars are not smoothed out in long exposures. The Sony exhibited good – though not great – “ISO invariant” performance. 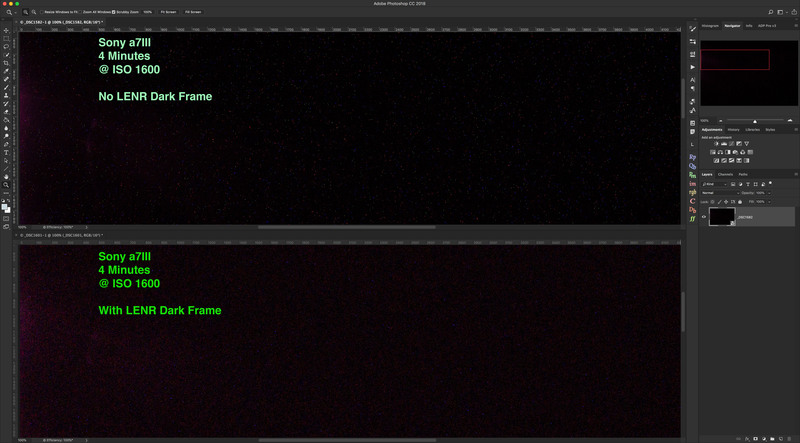 Dark frame subtraction using Long Exposure Noise Reduction removed most – but not all – hot pixels from thermal noise. Live View was absolutely superb, though the outstanding Bright Monitoring function is as well-hidden as Sony could possibly make it. The Sony showed some slight edge-of-frame shadowing from the mask in front of the sensor, as well as a weak purple amp glow. • The a7III lacks any internal intervalometer or ability to add one via an app. But it is compatible with many external intervalometers and controllers. 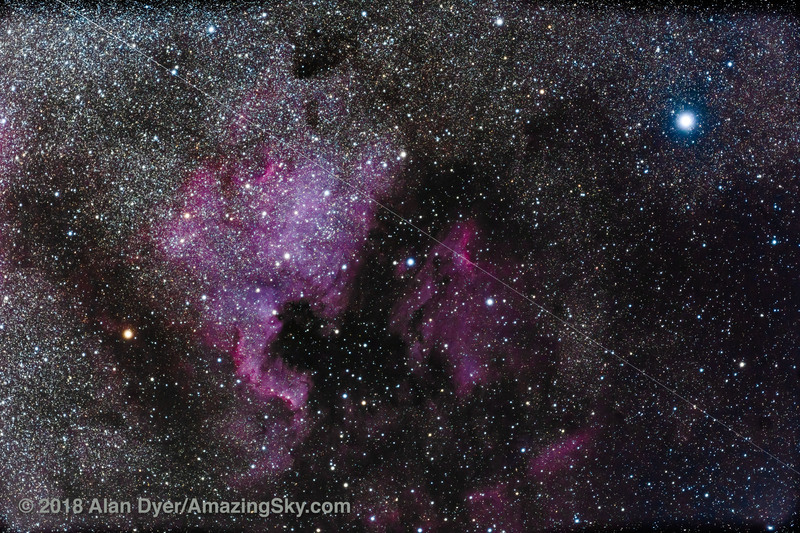 • The a7III’s red sensitivity for recording H-Alpha-emitting nebulas was poor. • It lacks the “light-frame” buffer offered by full-frame Canons that allows shooting several frames in quick succession even with LENR turned on. The a7III offers 4K video and, at 24 frames-per-second, is full-frame. 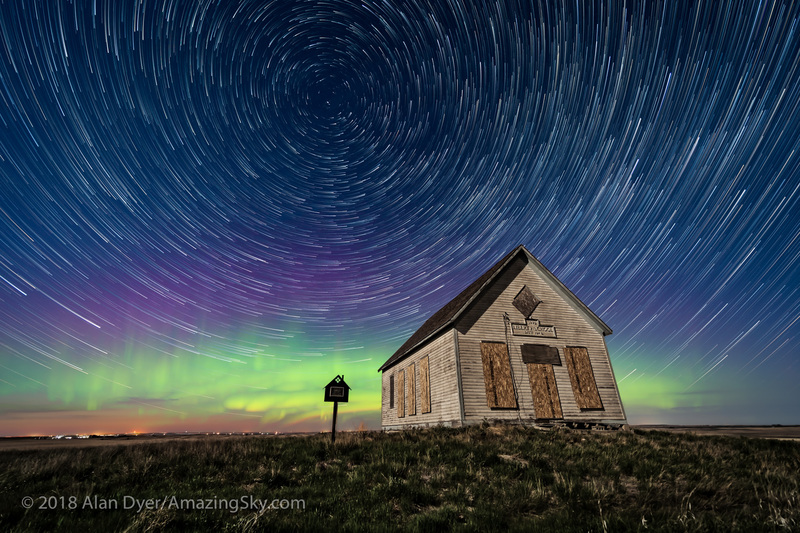 Shutter speeds can be as slow as 1/4-second, allowing real-time aurora shooting at reasonable ISO speeds. Shooting typical 400-frame time-lapses used about 40% of the battery capacity, similar to the other DSLRs. 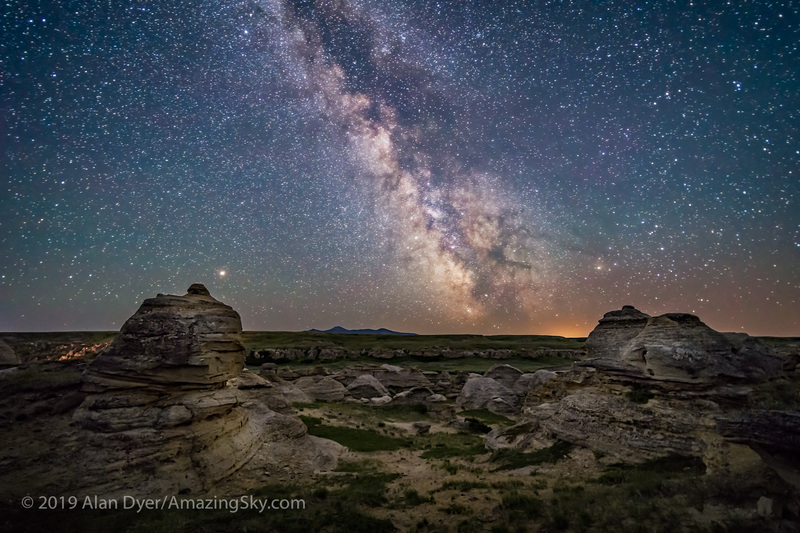 The Sony a7III is a superb camera for still and time-lapse nightscape shooting, and excellent for real-time aurora videos. It is good, though not great, for long-exposure deep-sky imaging. STAR TRAILS and AURORA With the Laowa 15mm lens and Sony a7III, for 155 exposures, all 20 seconds at f/2.8 and at ISO 800, and taken as part of a 360-frame time-lapse. The Sony a7III uses a sensor that is “Backside Illuminated,” a feature that promises to improve low-light performance and reduce noise. I saw no great benefit from the BSI sensor. 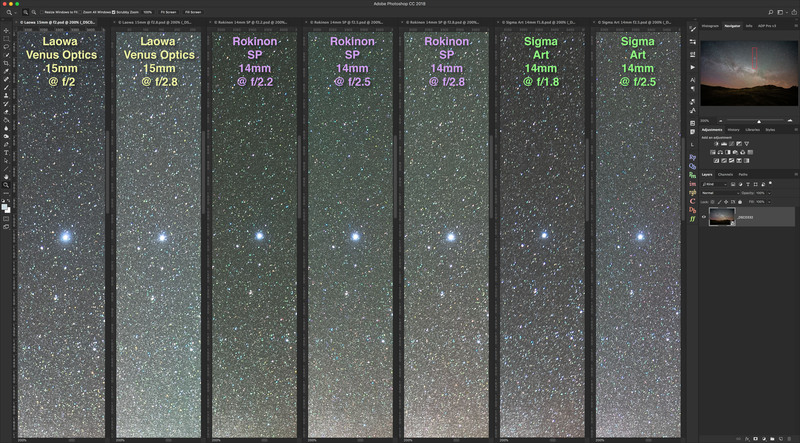 Noise at typical astrophoto ISO speeds – 800 to 6400 – were about equal to the four-year-old Nikon D750. That was a bit surprising. I expected the new BSI-equipped Sony to better the Nikon by about a stop. It did not. This emphasizes just how good the Nikon D750 is. 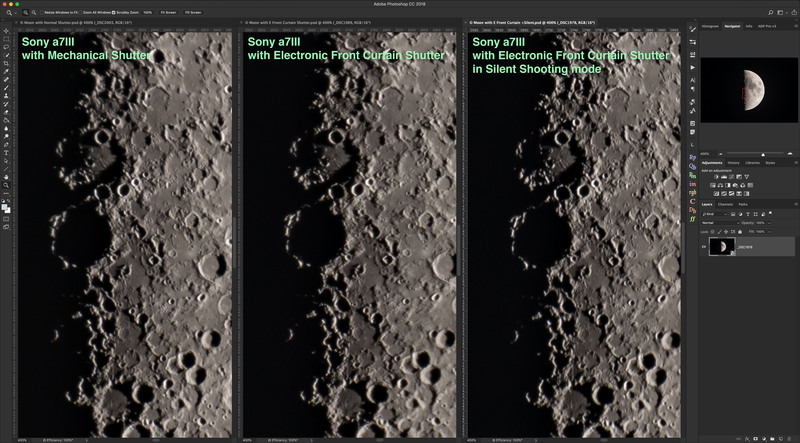 Nevertheless, noise performance of the Sony a7III was still excellent, with both the Sony and Nikon handily outperforming the Canon 6D MkII, with its slightly smaller pixels, by about a stop in noise levels. NOTE: I performed all Raw developing with Adobe Camera Raw v10.3. It is possible some of the artifacts I saw are due to ACR not handling the a7III’s .ARW files as well as it should. But to develop all the images from Sony, Nikon, and Canon equally for comparisons, ACR is the best choice. 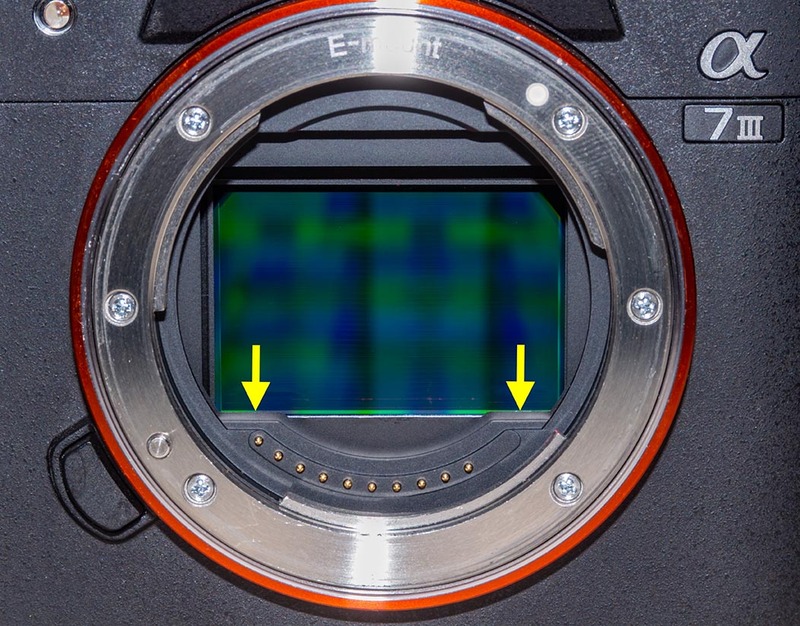 The Sony a7III exhibited noise levels similar to the Nikon D750 at high ISOs, with the Sony and Nikon each about a stop better for noise than the Canon 6D MkII. At ISO 3200, a common nightscape ISO speed, all three cameras performed well in this moonlit scene. The Canon shows a darker sky as its images were taken a few minutes later. 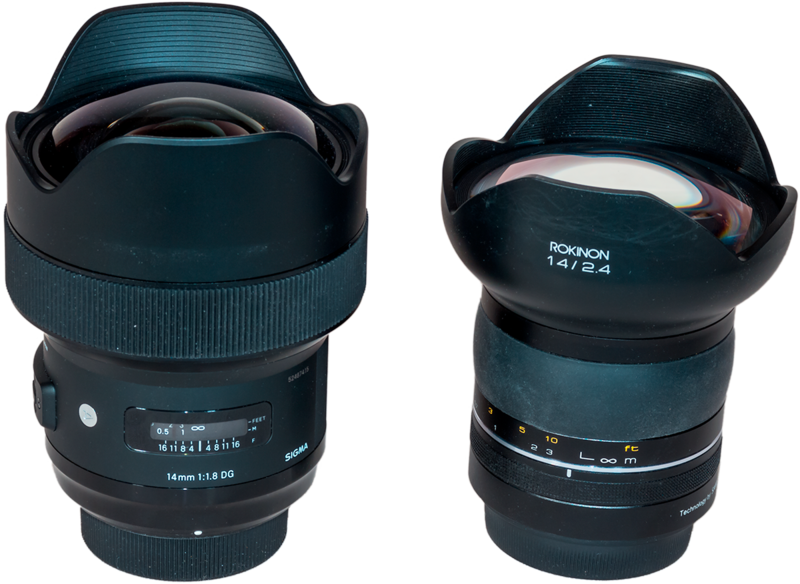 The Nikon had the Sigma 14mm Art lens; the Canon and Sony used the same Rokinon 14mm SP lens. At ISO 6400, the Canon begins to show excessive noise, about a stop worse than the Nikon and Sony. No luminance noise reduction was applied to these images. All cameras show an equal number of stars recorded. Both the Sony and Nikon use sensor and signal path designs that are “ISO invariant.” As a result, images shot underexposed at slower ISOs, then boosted in exposure later in processing look identical to properly exposed high-ISO images. Well, almost. The Sony still showed some discoloration artifacts and added noise when boosting images by +4 EV that the Nikon did not. Even with uncompressed Raws, the Sony was not quite as ISO invariant as the Nikon, though the difference shows up only under extreme push-processing of badly underexposed frames. Plus, the Sony was far better than the Canon 6D MkII’s “ISO variant” sensor. Canon really needs to improve their sensors to keep in the game. Here I shot all three cameras at ISO 6400 for a correct exposure for the scene, and also at ISO 1600 and ISO 400, for images 2 and 4 stops underexposed respectively. These were then boosted in Adobe Camera Raw by 2 and 4 stops in Exposure Value (EV) to compensate. With ISO invariant sensors the boosted images should look similar to the well-exposed image. A closeup of the scene shows the ISO variant Canon exhibited more noise and magenta discoloration in the +4 EV boosted image. The Nikon looks very clean, but the Sony also shows discoloration, green here, and an increase in noise. These are all uncompressed 14-bit Raw files. 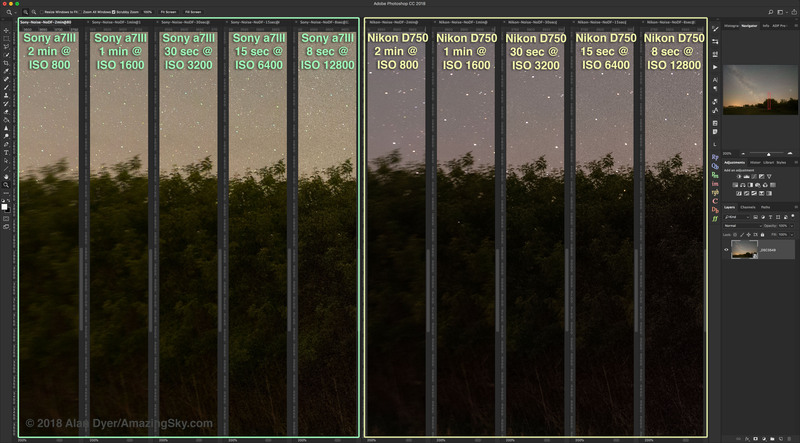 Comparing just the two ISO-invariant cameras, the Sony and the Nikon, on another night, shows a similar performance difference when boosting underexposed slow-ISO images later in Camera Raw. The Sony begins to show more noise and now a magenta discoloration in the +3 and +4 EV images, similar to, but not as badly as does the ISO-variant Canon 6D MkII. The Sony a7III offers a choice of shooting Uncompressed or Compressed Raw files. Uncompressed Raws are 47 Mb in size; Compressed Raws are 24 Mb. In well-exposed images, I saw little difference in image quality. But the dark shadows in underexposed nightscapes withstood shadow recovery better in the uncompressed files. Compressed files showed more noise and magenta discoloration in the shadows. 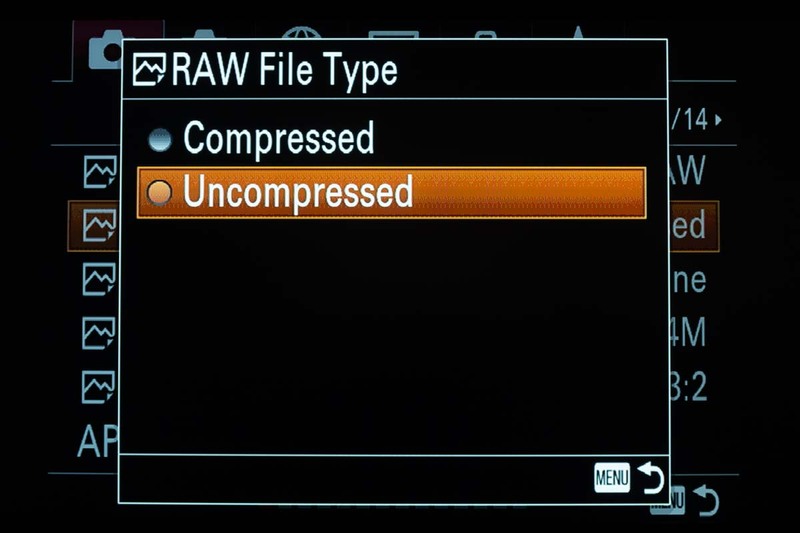 It is not clear if Sony’s compressed Raws are 12-bit vs. 14-bit for uncompressed files. Nevertheless, for the demands of nightscape and deep-sky shooting and processing, I suggest shooting Uncompressed Raws. Use Compressed only if you plan to take lots of time-lapse frames and need to conserve memory card space on extended shoots. 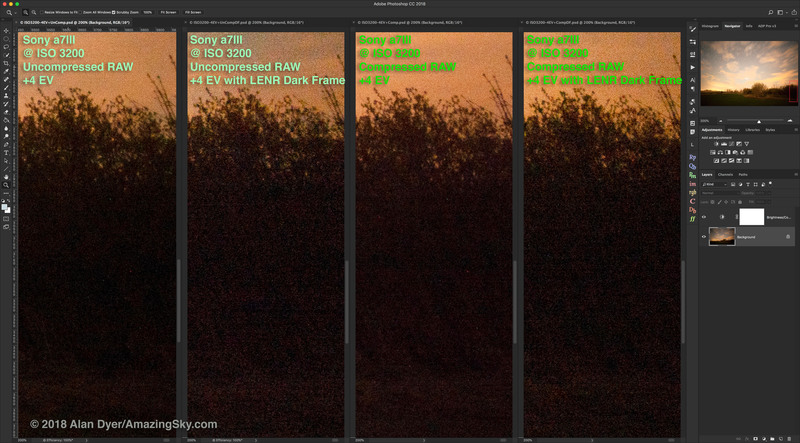 Here I compare any image degradation from using compressed vs. uncompressed Raws, and from employing Long Exposure Noise Reduction. 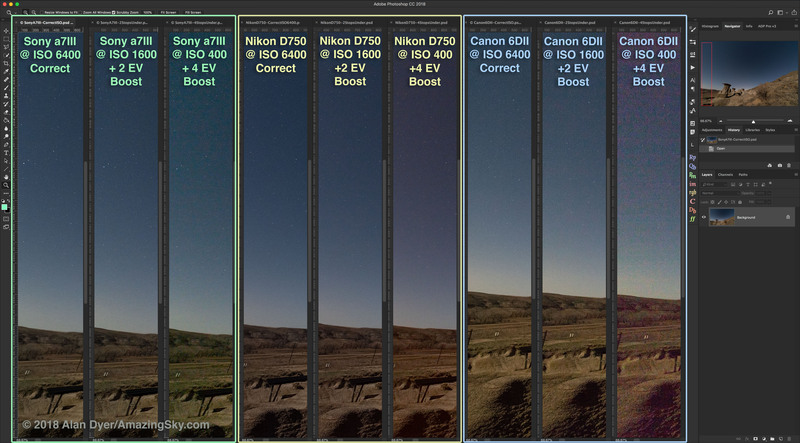 Images are only slightly underexposed and boosted by +1 EV in Camera Raw. Shadow noise is similar in all images, with the ones taken with LENR on showing elimination of colored hot pixels, as they should. The same scene but now underexposed by 4 stops and boosted by +4 EV later shows greater differences. The compressed image shows more noise and discoloration, and the images taken with LENR on, while eliminating hot pixels, show more random luminance noise. Keep in mind, these are vastly underexposed images. A real-world deep-sky example shows the same comparison. All images are well-exposed, for tracked and guided 4-minute exposures. The ones taken with LENR on show fewer hot pixels. The compressed images appear identical to the uncompressed files for noise and star content. 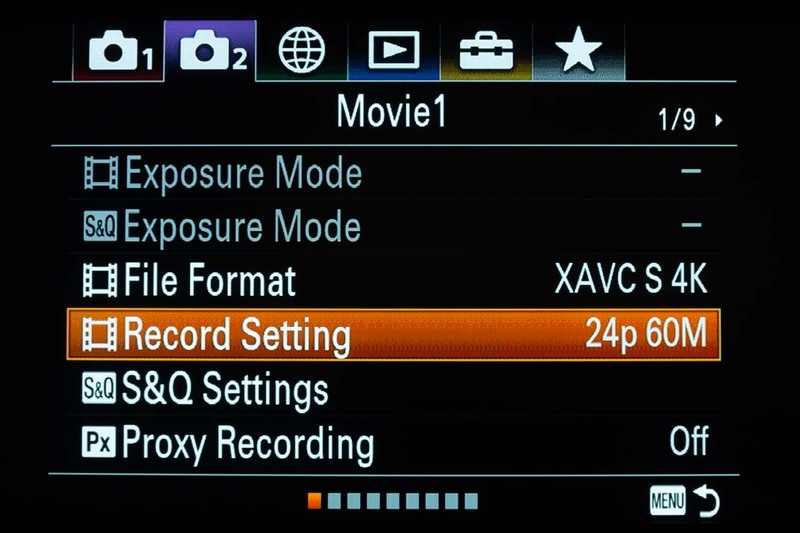 Over the last year or so, firmware updates from Sony introduced a much-publicized penchant for Sony Alphas to “eat” stars even in Raw files, apparently due to an internal noise reduction or anti-aliasing routine users could not turn off. Stars were smoothed away along with the noise in exposures longer than 3.2 seconds in some Sony cameras (longer than 30 seconds in others). I feel that in the a7III the Star Eater has been largely vanquished. As the images below show, there is a very slight one-pixel-level softening that kicks in at 4 seconds and longer but it did not eat or wipe out stars. Stars are visible to the same limiting magnitude and close double stars are just as well resolved across all exposures. Indeed, at slower ISOs and longer exposures, more stars are visible. I saw none of the extreme effects reported by others with other Sonys, where masses of faint stars disappeared or turned into multi-colored blotches. I did not see any significant “star eating” in any long exposures even up to the 4 minutes I used for some deep-sky shots. In images taken at the same time with other cameras not accused of star eating, the Sony showed just as many faint stars as the competitors. Long exposures showed just as many stars as did short exposures. This series of tracked images (shown here blown up 200%) goes from 2 seconds to 2 minutes, with decreasing ISO speed to equalize the exposure value across the series. Between 3.2s and 4s a very slight one-pixel-level softening does kick in, reducing noise and very slightly blurring stars. Yet, just as many stars are recorded and are resolved, and at the lower ISOs/longer exposures more stars are visible because faint stars are not lost in the noise. This is the same series as above but now blown up 400% to better reveal the very subtle change in pixel-level sharpness as exposure lengthened from 3.2 to 4 seconds. Noise (most noticeable in the trees) is reduced and stars are very slightly softened. But none are “eaten” or wiped out. And star colors are not affected, though very small stars are sometimes green, an effect seen in other cameras due to de-Bayering artifacts. 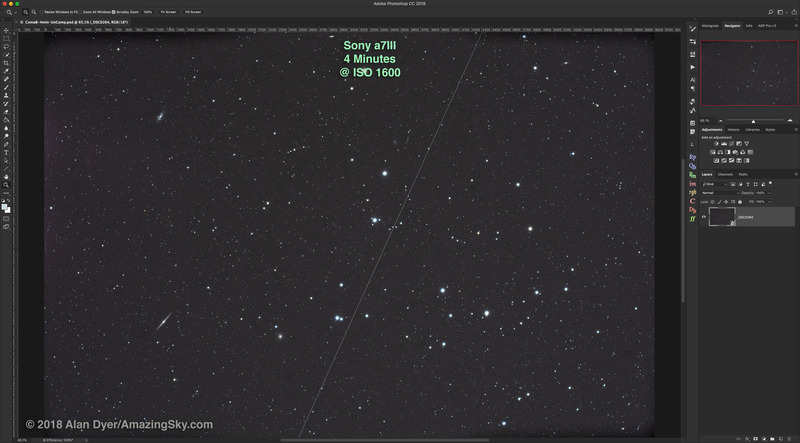 Tracked deep-sky images through a telescope using 4-minute exposures show the Sony a7III recording an equal number of faint stars as the Canon 6D MkII. No luminance noise reduction was applied to these images in processing. Another example with 4-minute exposures again demonstrates no problems recording faint stars. The Canon does show more noise than the Sony. No noise reduction was applied in processing. 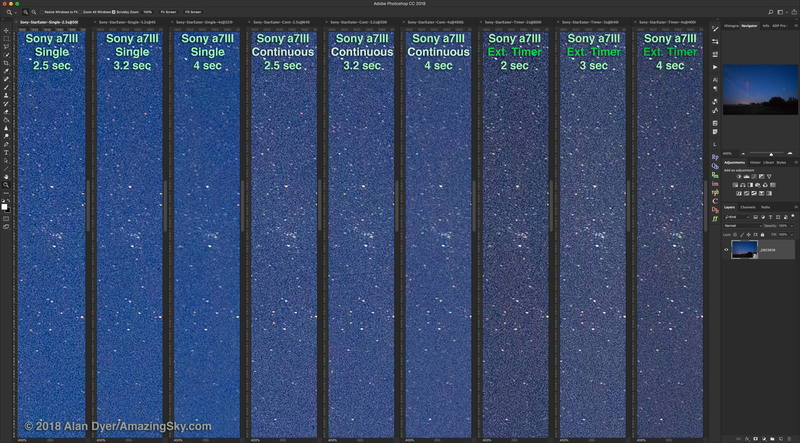 For yet more evidence, this is a comparison of the Sony a7III vs. the Nikon D750 in tracked 90-second exposures with 14mm lenses. Again, the Sony records just as many stars as the Nikon. For elimination of hot pixels from thermal noise I prefer to use Long Exposure Noise Reduction when possible for nightscape and deep-sky images, especially on warm summer nights. Exceptions are images taken for star trail stacking and for time-lapses, images that must be taken in quick succession, with minimal time gap between frames. Turning on LENR did eliminate most hot pixels in long exposures, but not all. A few remained. Also, when boosting the exposure a lot in processing, the images taken with LENR on showed more shot and read noise than non-LENR frames. The dark frame the camera was taking and subtracting was actually adding some noise, perhaps due to a temperature difference. The cause is not clear. Sony advises that when using LENR Raw images are recorded with only 12-bit depth, not 14-bit. This might be a contributing factor. Yet frames taken with LENR on were the same 47 Mb size as normal uncompressed frames. For those who think this is normal for LENR use, the Nikon D750 shows nothing like this – frames taken with LENR on are free of all hot pixels and do not show more shot or read noise, nor deterioration of shadow detail from lower bit depths. However, I emphasize that the noise increase from using LENR with the Sony was visible only when severely boosting underexposed images in processing. In most shooting situations, I found using LENR provided the overriding positive benefit of reducing hot pixels. It just needs to be better, Sony! These are 4-minute exposures of dark frames (i.e. the lens cap on!) 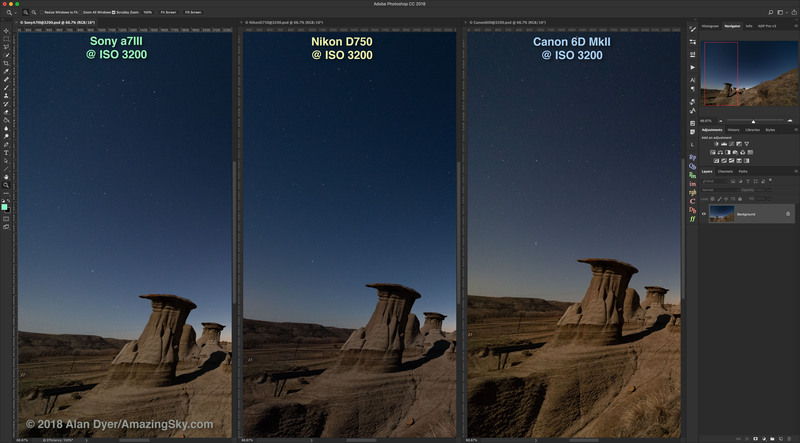 taken at room temperature with and without Long Exposure Noise Reduction. In the Sony, LENR did not eliminate all hot pixels nor the magenta amp glow at the left edge. LENR also added a background level of fine noise. These have had exposure and contrast increased to exaggerate the differences. Dark frames taken with the Nikon D750 under the same circumstances and processed the same show none of the residual hot pixels and added background noise when LENR is employed. Nor is there any amp glow anywhere along the frame edges. 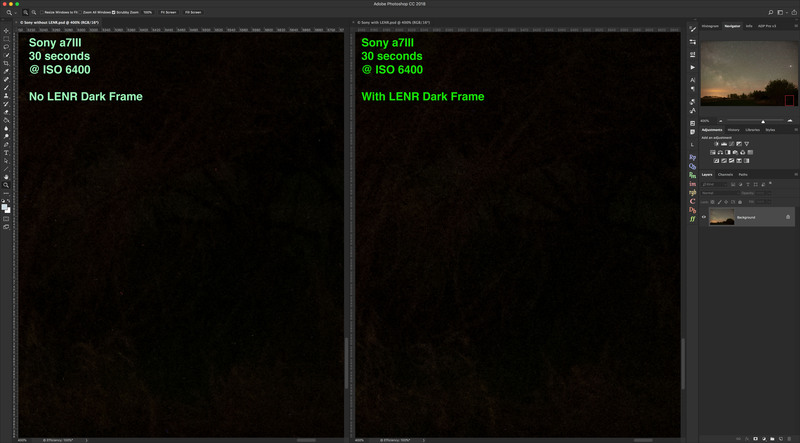 A real-world example with the Sony, with a properly exposed nightscape, shows that the ill effects of using LENR don’t show up under normal processing. You do get the benefit of reduced hot pixels in shadows, especially on a warm night like this was. This is a blow-up of the lower corner of the frame, as indicated. How evenly an image is illuminated is a common factor when testing lenses. But astrophotography, which often requires extreme contrast boosts, reveals non-uniform illumination of the sensor itself, regardless of the optics, originating from hardware elements in front of the sensor casting shadows onto the sensor. This is most noticeable – indeed usually only noticeable – when shooting deep-sky targets though telescopes. With DSLRs it is the raised mirror which often casts a shadow, produced a dark vignetted band along the bottom of the frame. Its extent varies from camera model to model. With a mirrorless camera the sensor is not set far back in a mirror box, as it is in a DSLR. As such, I would have expected a more uniformly illuminated sensor. SENSOR CLOSE-UP showing intruding mask edges. Instead, I saw a slight shadowing at the top and bottom edges but just at the corners. This is from a thin metal mask in front of the sensor. It intrudes into the light path ever so slightly. It shouldn’t. This is an annoying flaw, though applying “flat fields” or ad hoc local adjustments should eliminate this. But that’s a nuisance to do, and should not be necessary with a mirrorless camera. Worse is that long deep-sky exposures at high ISOs also exhibited a faint purple glow at the left edge, perhaps from heat from nearby electronics, a so-called “amp glow.” Or I’ve read where this is from an internal infrared source near the sensor. Taking a dark frame with LENR did not eliminate this, and it should, demonstrating again that for whatever reason in the a7III LENR is not as effective as it should be. I have not seen such “amp” glows in cameras (at least in the DSLRs I’ve used) for a number of years, so seeing it in the new Sony a7III was another surprise. This would be much tougher to eliminate in deep-sky images where the extreme contrast boosts we typically apply to images of nebulas and galaxies will accentuate any odd glows. One supplier of filter-modified cameras, Spencer’s Camera, also refuses to modify Sonys, because this glow renders them poor choices for filter modification, for those wanting cameras with deeper red sensitivity. 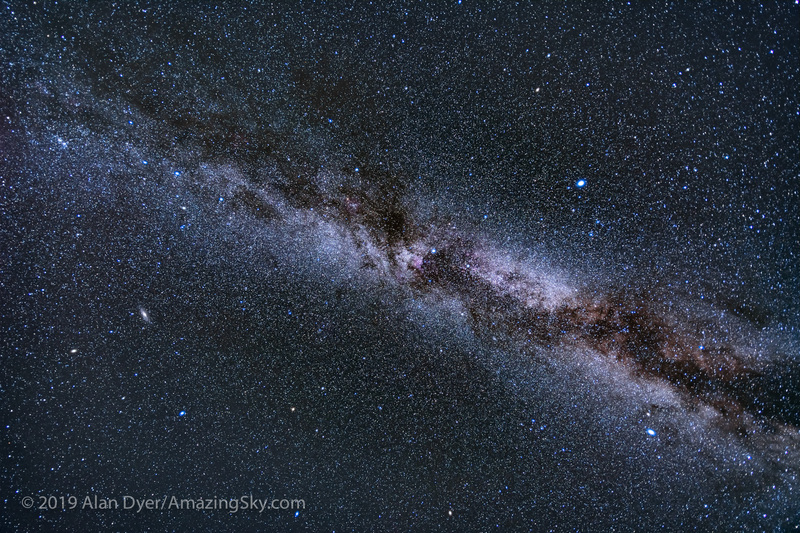 The full field of a deep-sky image taken through an f/5 70mm astrographic refractor shows the minor level of edge darkening at the corners from shadowing of the sensor in the Sony. SONY FIELD ILLUMINATION #2 The full field of a deep-sky image taken through an f/6 105mm refractor shows the level of edge darkening at the edges from shadowing of the sensor in the Sony, and the purple “amplifier” glow at the left edge present in all very long exposures. When shooting deep-sky objects, particularly red nebulas, we like a camera to have a less aggressive infrared cutoff filter, to pick up as much of the deep red Hydrogen-Alpha emission line as possible. The Sony showed poor deep-red sensitivity, though not unlike other cameras. It was a little worse than the stock Canon 6D MkII. This isn’t a huge detriment, as anyone who really wants to go after deep nebulosity must use a “filter-modified” camera anyway. Canon and Nikon both offered factory modified cameras at one time, notably the Canon 60Da and Nikon D810a. Sony doesn’t have an “a” model mirrorless. 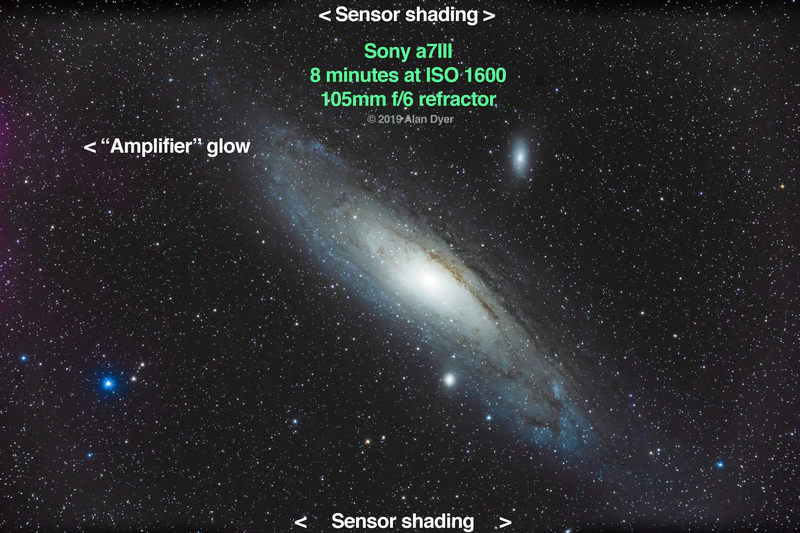 To get the most out of the Sony for deep-sky imaging you would have to have it modified by a third-party, though the amp glow described above makes it a poor choice for modification. 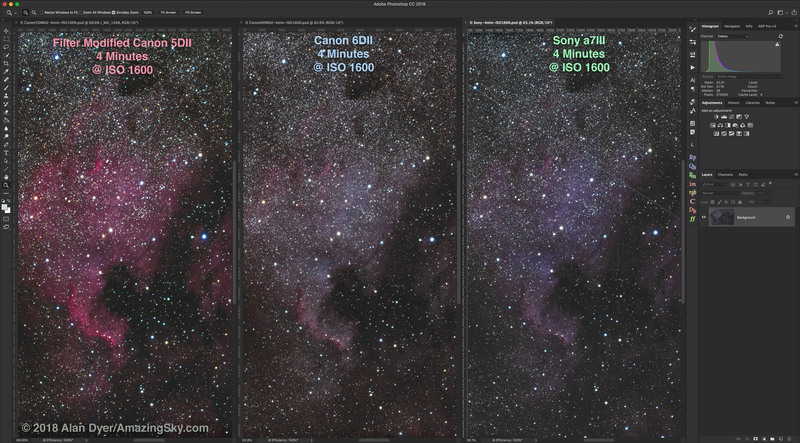 Three deep-sky exposures compare cameras for red sensitivity: a filter-modified Canon 5D MkII, a stock Canon 6D MkII, and the stock Sony a7III. As expected the filter-modified camera picks up much more red nebulosity. The Sony doesn’t do quite as well as the Canon 6D MkII. Up to now my report on the Sony a7III hasn’t shown as glowing a performance as all the YouTube reviews would have you believe. But Live Focus is where the a7III really stands out. I love it! 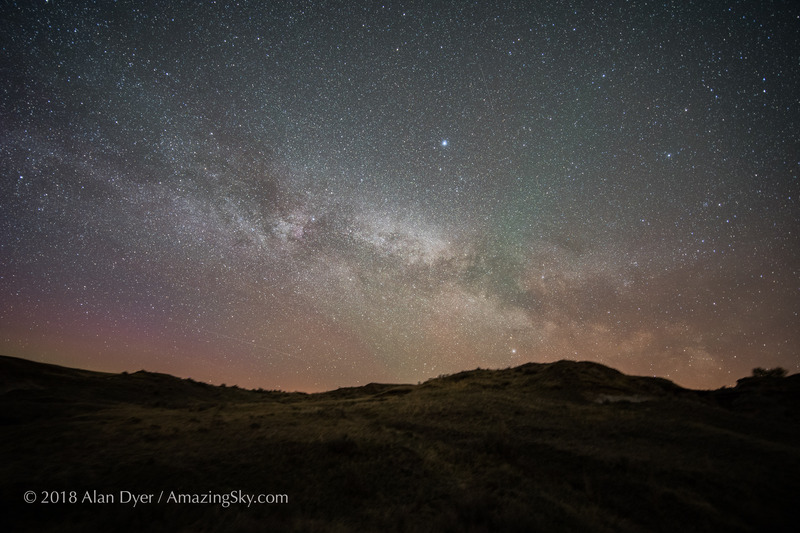 In Live View it is possible to make the image so bright you can actually see the Milky Way live on screen! Wow! 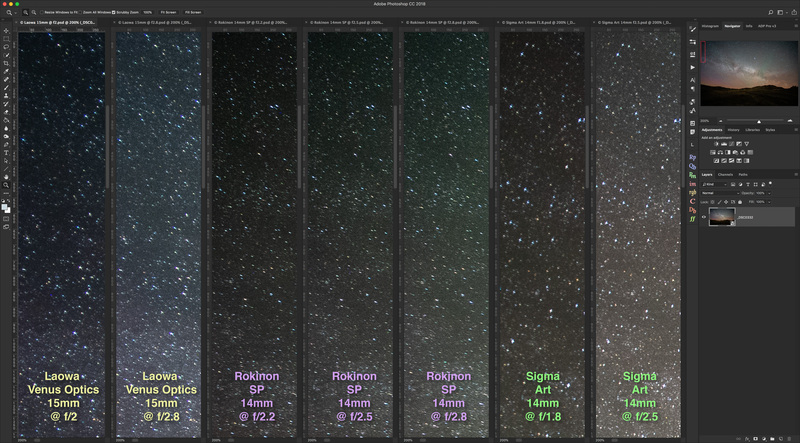 This makes it so easy to frame nightscapes and deep-sky fields. 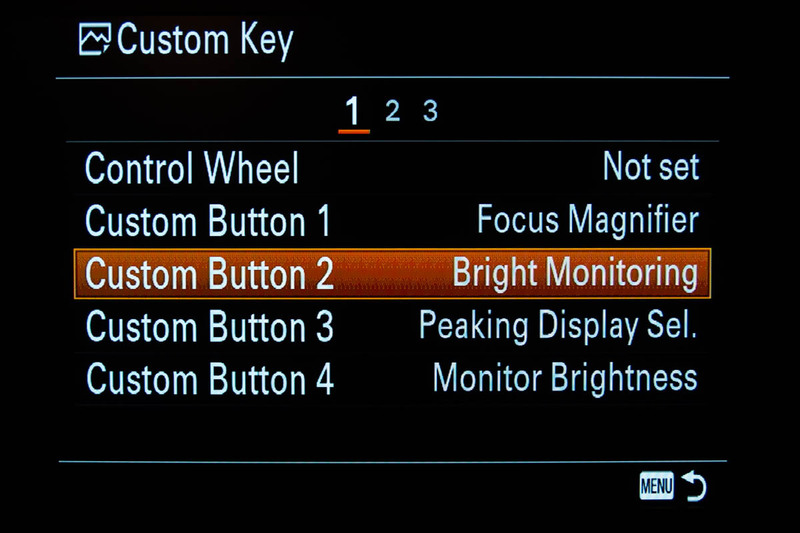 The excellent Bright Monitoring function is accessible only off the Custom Key menu where it appears as a choice on the Display/Auto Review2 page (below) that can be assigned to a C button. 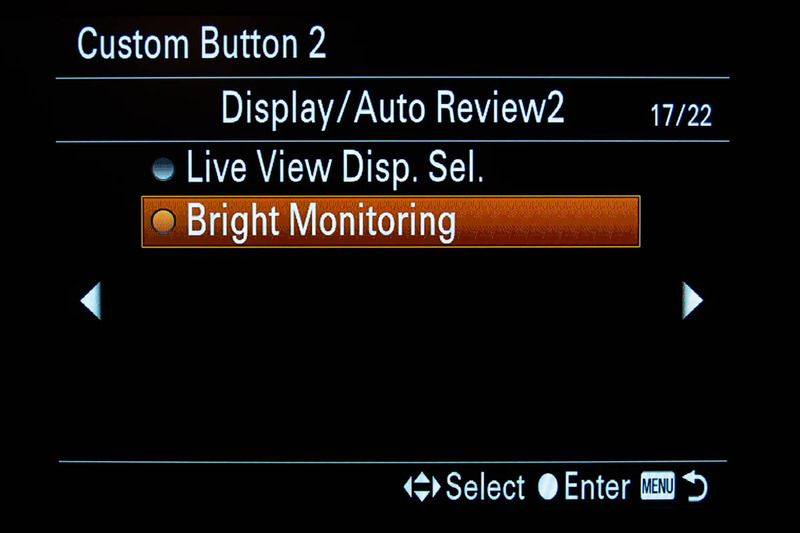 But this special “Bright Monitoring” mode is as well hidden as Sony could make it. Unless you actually read the full-length 642-page PDF manual (you have to download it), you won’t know about it. 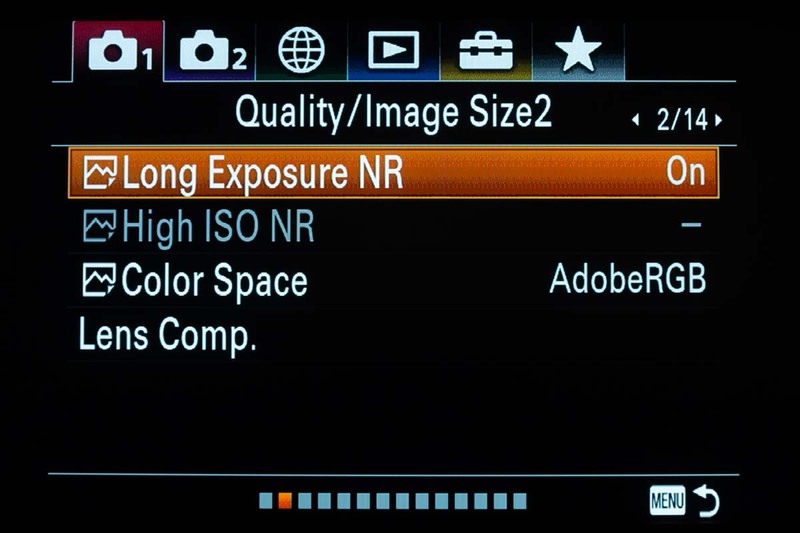 Bright Monitoring does not appear in any of the in-camera menus you can scroll through, so you won’t stumble across it. 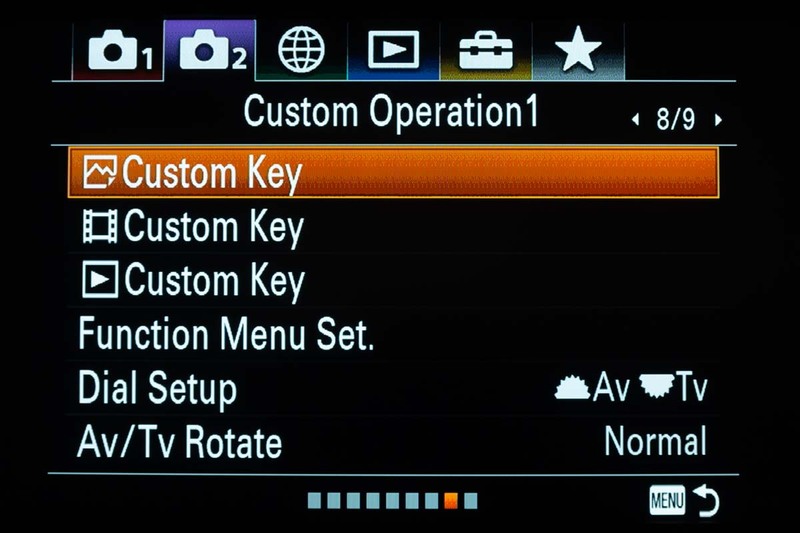 Instead, you have to go to the Camera Settings 2 page, then select Still Image–Custom Key. In the menu options that appear you can now scroll to one called Bright Monitoring. Surprise! Assign it to one of the hardware Custom C buttons. I put it on C2, making it easy to call up when needed. The other Live View function that works well, but also needs assigning to a C button is the Camera Settings 1 > Focus Magnifier. I put this on C1. It magnifies the Live View by 5.9x or 11.7x, allowing for precise manual focusing on a star. Camera Settings 2 > Live View Display > Setting Effect ON. 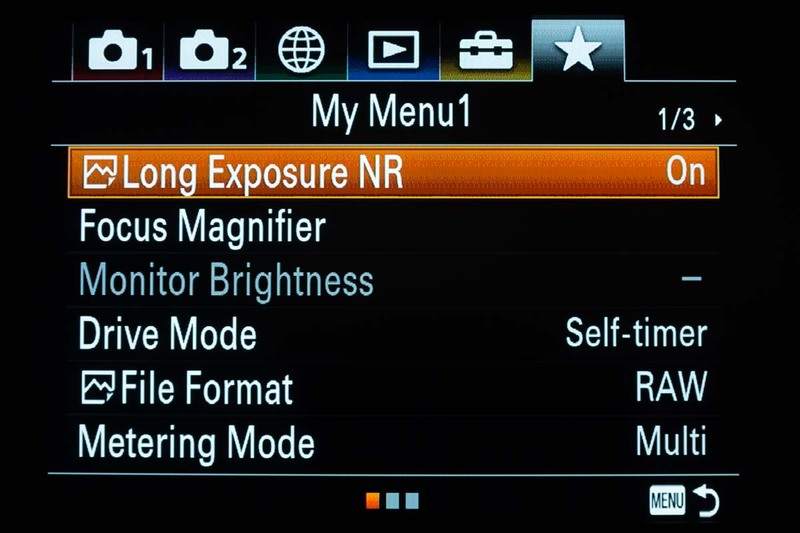 This allows the Live View image to reflect the camera settings in use, better simulating the actual exposure, even without Bright Monitoring on. Camera Settings 1 > Peaking Setting. Turning this ON superimposes a shimmering effect on parts of an image judged in focus. This might be an aid, or an annoyance. Try it. In all, the Sony provides superb, if well-hidden, Live View options that make accurately framing and focusing a nightscape or time-lapse scene a joy. Here are some other Sony a7III features I found of value for astrophotography, and for operating the camera at night. SONY TILTING SCREEN It tilts up and down but does not flip out as with the Canon 6D MkII’s. Still, this is a neck- and back-saving feature for astrophotography. 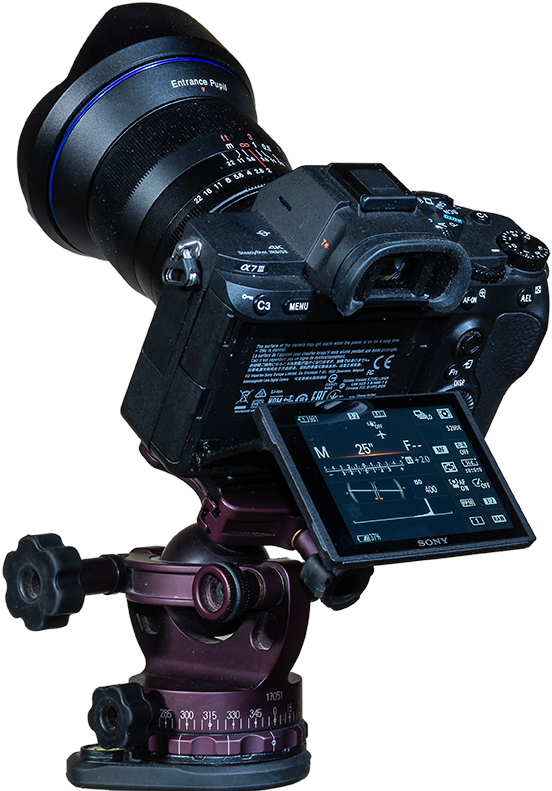 Like the Nikon D750, the Sony’s screen tilts vertically up and down, great for use when on a telescope, or on any tripod when aimed up at the sky. As photographers age, this becomes a more essential feature! The four C buttons can be programmed for oft-used functions, making them easy to access at night. Standard functions such as ISO and Drive Mode are easy to get at on the thumb wheel, unlike the Nikon D750 where I am forever hunting for the ISO or Focus Zoom buttons, or the Canon 6D MkII which successfully hides the Focus Zoom and Playback buttons at night. In new models, Sony now offers the option of a final “My Menu” page which you can populate with often-used functions from the other 35 pages of menu commands! 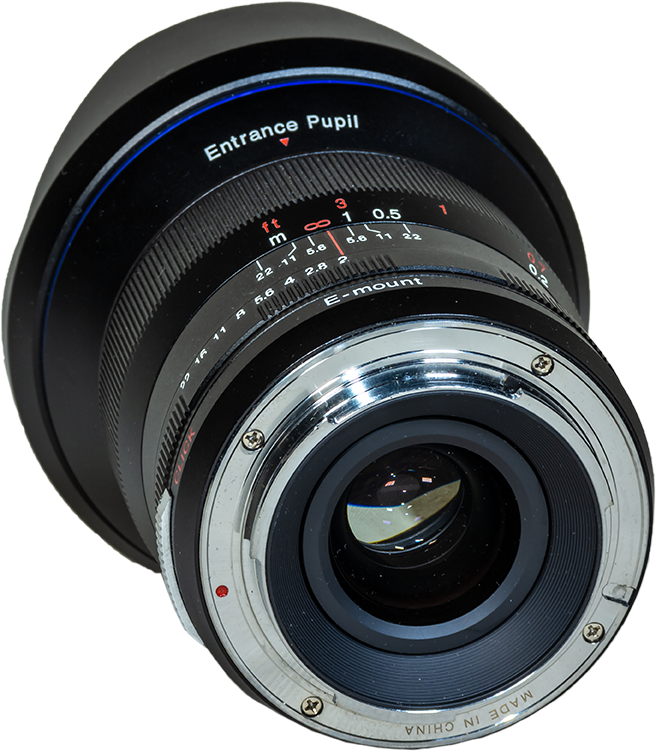 Using the right lens adapter (I use one from Metabones), it is possible to use lenses with mounts made for Canon, Nikon, Sigma and others. Plus there are an increasing number of lenses from third parties offered with native Sony E-mounts. This is good news, as astrophotography requires fast, high-quality lenses, and the Sony allows more choices. The compact a7III body weighs a measured 750 grams, vs. 900 grams each for the Nikon D750 and Canon 6D MkII. The lower weight can be helpful for use on lightweight telescopes, on small motion control devices, and for simply keeping weight and bulk down when traveling. Not essential, but having two card slots is very helpful, for backup, for handling overflows from very long time-lapse shoots, or assigning them for stills vs. movies, or Raws vs. JPGs. Only Slot 1 will work with the fastest UHS II cards that are needed for recording the highest quality 4K video. It is possible to power the camera though the USB port (indeed that’s how you charge the battery, as no separate battery charger is supplied as standard, a deficiency). This might be useful for long shoots, though likely as not that same USB port will be needed for an intervalometer or motion control device. But if the Sony had a built-in intervalometer…! 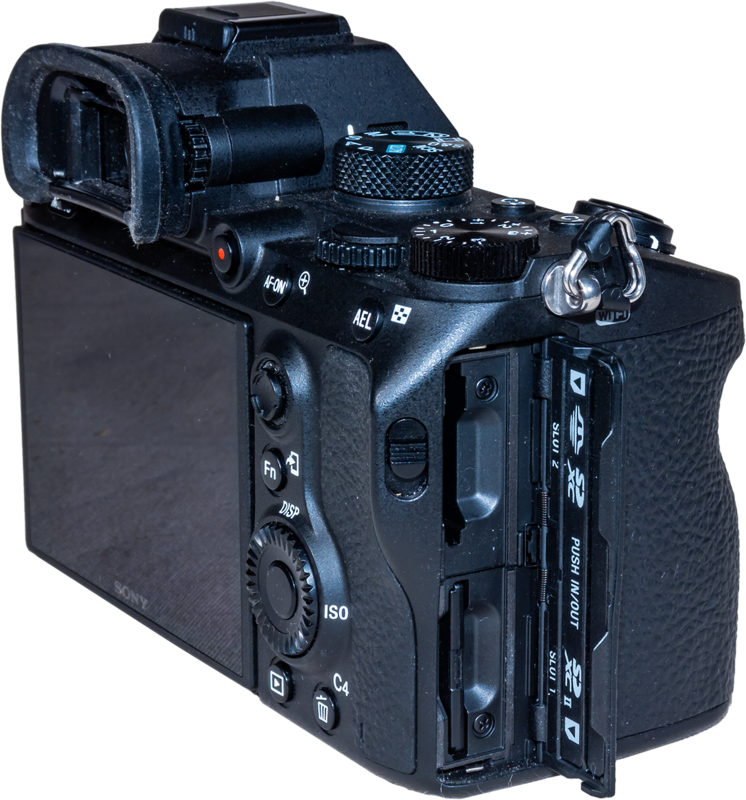 To reduce battery drain it is possible to turn off the EVF completely – I find I never use it at night – and to turn off the LCD display when shooting, though the latter is an option you have to activate to add to the Display button’s various modes. The downside is that when shooting is underway you get no reassuring indication anything is happening, except for a brief LED flash when an image is written to a card. 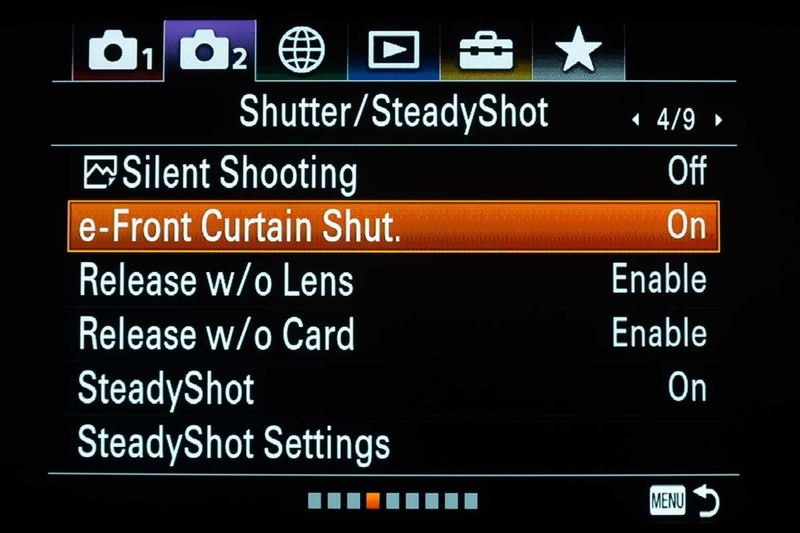 Most DSLRs do not offer this, but the Sony’s option of an electronic front curtain shutter and the additional Silent Shooting mode completely eliminates vibration, useful for some high-magnification shooting through telephotos and telescopes. This trio compares closeups of the Moon taken with and without electronic front curtain shutter. All were taken through a 130mm refractor telescope at f/12 using a Barlow lens. The image with e-shutter and in Silent Mode is a tad sharper, but that could be just as much from variations in seeing conditions as from the lower vibration from using the electronic shutter. 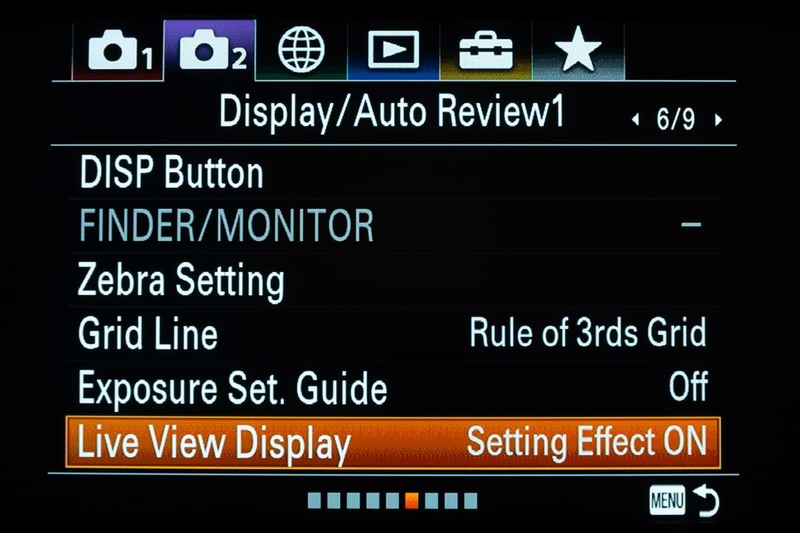 UPDATE: In April 2019 Sony issued a v3 Firmware update for the a7III which added an internal intervalometer. I had originally remarked that this useful function was missing. But no more! Thank you Sony! While a built-in intervalometer is not essential, I find I often do use the Canon and Nikon in-camera intervalometers for simple shoots. So it is great to have one available on the Sony. 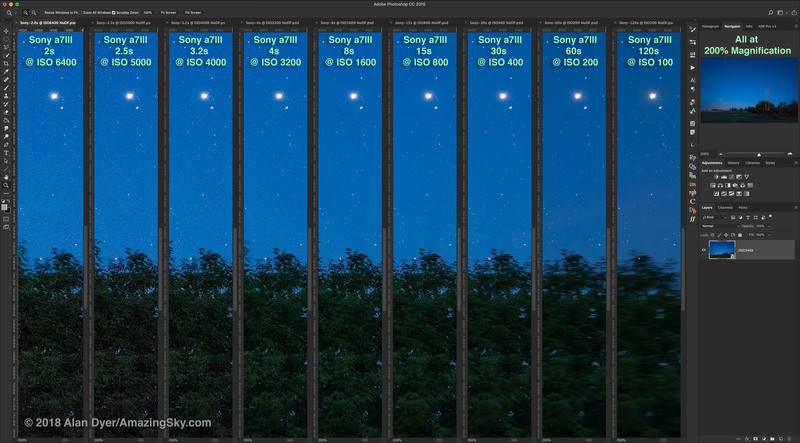 However, like other brands’ internal intervalometers Sony’s is good only for exposures up to 30 seconds long. However, while the Sony has a Bulb setting there is no Bulb Timer as there is with the Canon. The Bulb Timer would allow setting long Bulb exposures of any length in the camera. Instead, for any exposures over 30 seconds long (or time-lapses with >30-second-long frames) the Sony must be used with an external Intervalometer. I use a $50 Vello unit, and it works very well. It controls the Sony through the camera’s Multi USB port. Also missing, and present on most new Canons, are Multiple Exposure modes for in-camera stacking of exposures in a Brighten mode (for star trails) or Averaging mode (for noise smoothing). Yes, this can all be done later in processing, but having the camera do the stacking can often be convenient, and great for beginners, as long as they understand what those functions do, or even that they exist! When using its internal intervalometer, the Nikon D750 has an excellent Exposure Smoothing option. This does a fine job smoothing frame-to-frame flickering in time-lapses, something the Canon cannot do. Nor the Sony, as it has no intervalometer at all. This feature is little known and utilized, and only Canon full-frame cameras offer it. Turn on LENR and it is possible to shoot three (with the 6D MkII) or four (with the 6D) Raw images in quick succession even with LENR turned on. The Canon 5D series also has this. The dark frame kicks in and locks up the camera only after the series of “light frames” are taken. 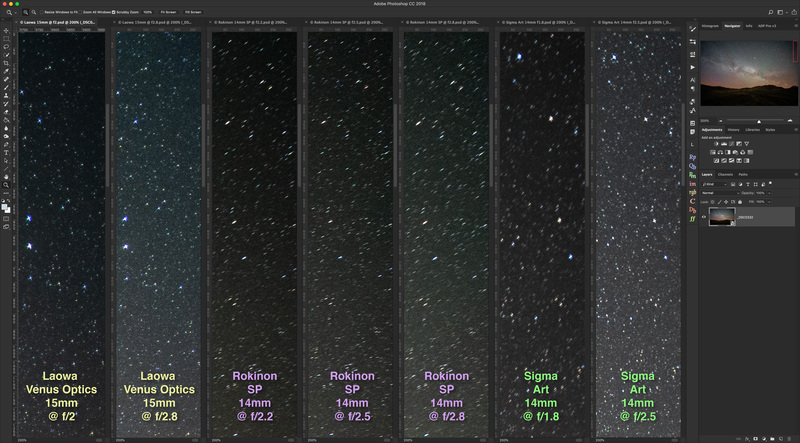 This is wonderful for taking a set of noise-reduced deep-sky images for later stacking. Nikons don’t have this, not even the D810a, and not Sonys. The Sony’s buttons are not illuminated. While these might add glows to long exposure images, if they could be designed not to do that (i.e. they turn off during exposures), lit buttons would be very handy at night. An alternative would be an LCD screen that was touch sensitive. 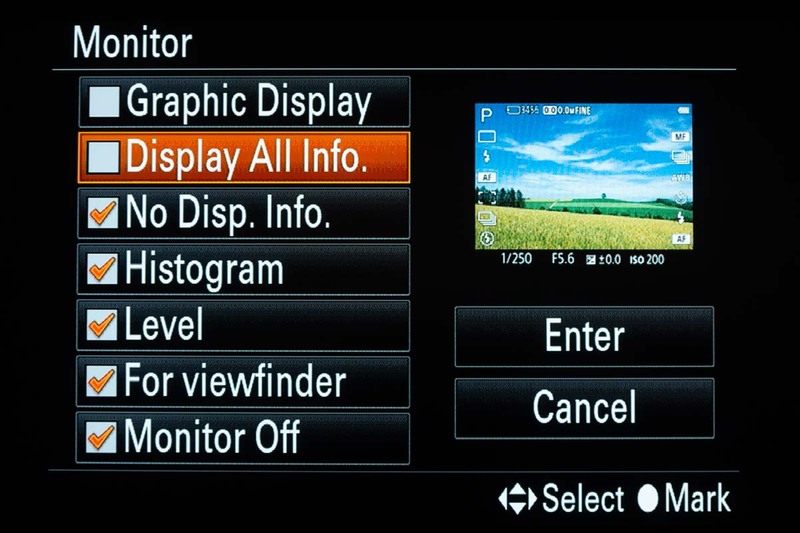 The Sony a7III’s screen is, but only to select an area for auto focus or zooming up an image in playback. The Canon 6D MkII has a fully functional touch screen which can be, quite literally, handy at night. For time-lapses, the Sony must be used with an external intervalometer like this Vello unit. Here’s another area where the new Sony a7III really shines. With a fast enough UHS-II Class card it can record 4K video up to 30 frames per second and at a bit rate of either 60 or 100 Mbps. At 24 fps videos are full-frame with no cropping. Hurray! 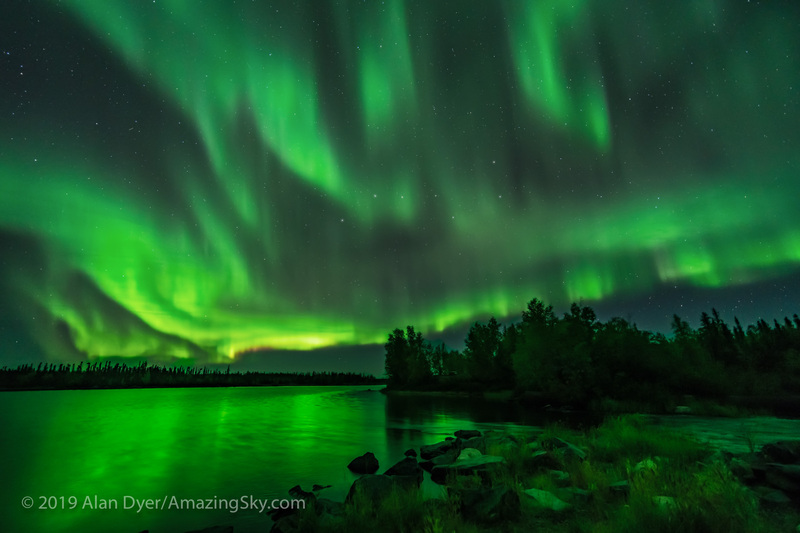 You can take full advantage of wide-angle lenses, great for auroras. At 30 fps, 4K videos are cropped with a 1.2x crop factor. In Movie Mode ISO speeds go up to ISO 102,400, but are pretty noisy, if unusable at such speeds. But when shooting aurora videos I found, to my surprise, I could “drag” the shutter speeds as slow as 1/4-second, fully 4 stops better than the Nikon’s slowest shutter speed of 1/60 second in Full HD, and 3 stops better than the Canon’s slowest movie shutter of 1/30 second. Coupled with a fast f/1.4 to f/2 lens, the slow shutter speed allows real-time aurora shooting at “only” ISO 6400 to 12,800, for quite acceptable levels of noise. I am very impressed! Real-time video of auroras is not possible with anything like this quality with the Nikon (I’ve used it often), and absolutely not with the Canon. And neither are 4K. 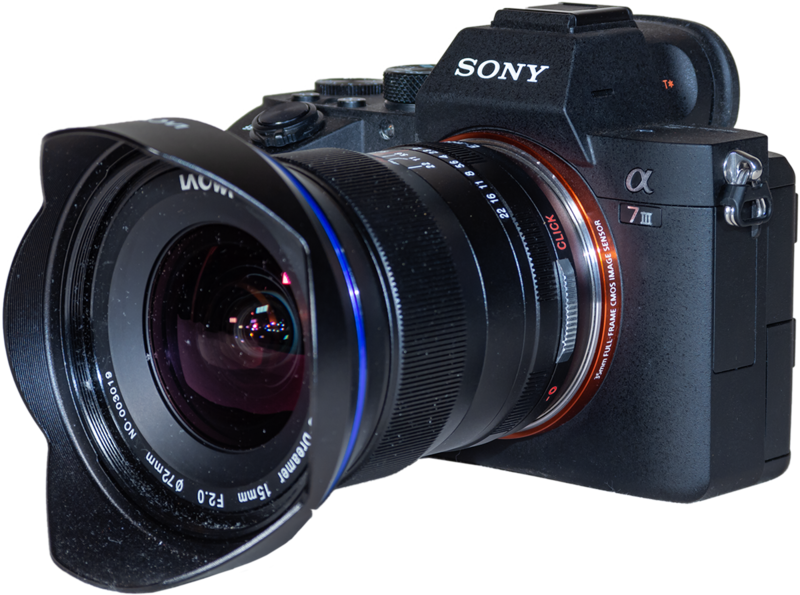 Is the a7III as good for low-light video as the Sony a7s models, with their larger 8.5-micron pixels? I would assume not, but not having an a7s (either Mark I or II) to test I can’t say for sure. 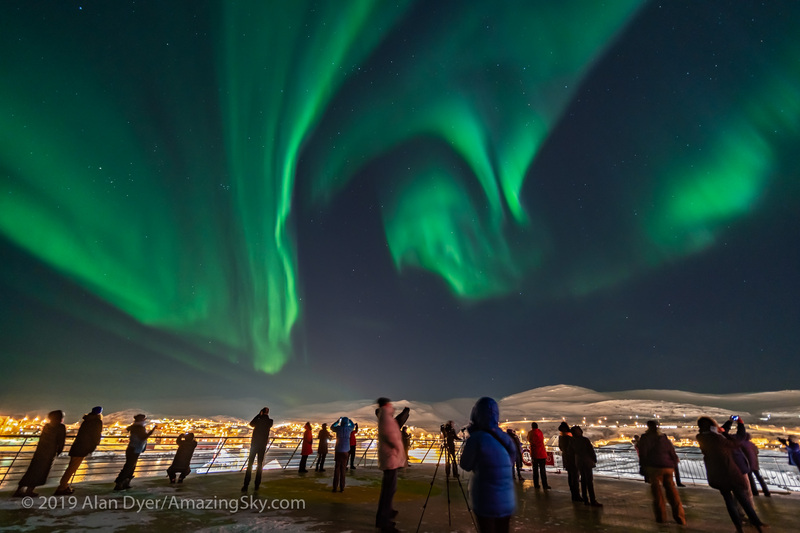 But the a7III should do the job for bright auroras, the ones with rapid motion worth recording with video, plus offer 24 megapixels for high-quality stills of all sky subjects. I think it’s a great camera for both astrophoto stills and video. 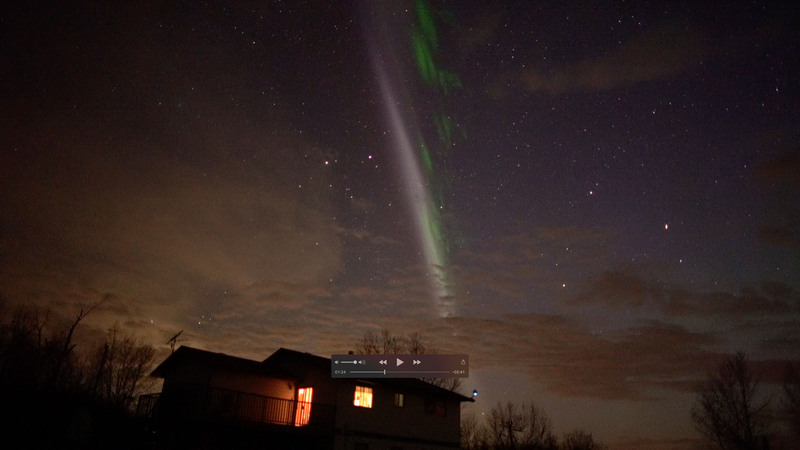 This is a frame grab from a real-time 4K video of a “Steve” aurora. 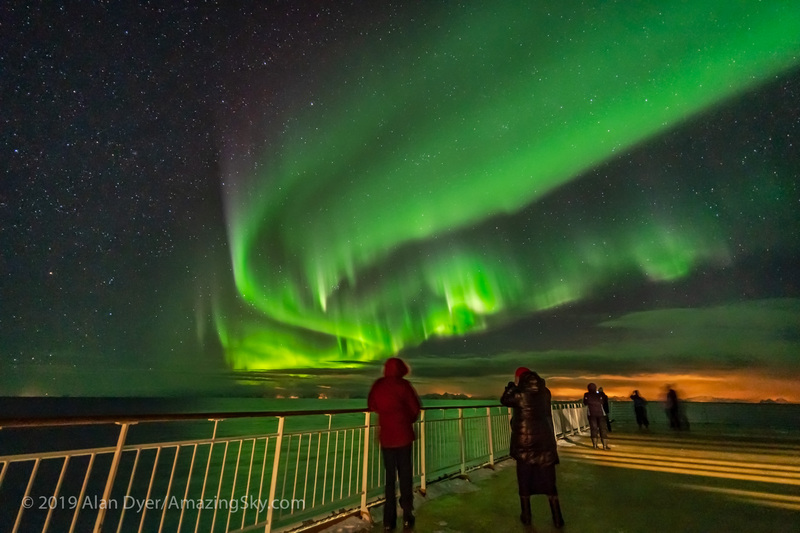 For another example of using the Sony a7III for recording real-time video of the night sky see this video of the aurora shot from Norway in March 2019. I found the a7III would use up about about 40% of the battery capacity in a typical 400-frame time-lapse on mild spring nights, with 30-second exposures. This is with the EVF and rear LCD Display OFF, and the camera in Airplane mode to turn off wireless functions to further conserve battery power. I was using the wired Vello intervalometer. This is excellent performance on par with the DSLRs I use. At last, we have a mirrorless camera that not only doesn’t eat stars, it also does not eat batteries! One battery can get you through a night of shooting, though performance will inevitably decline in winter, as with all cameras. 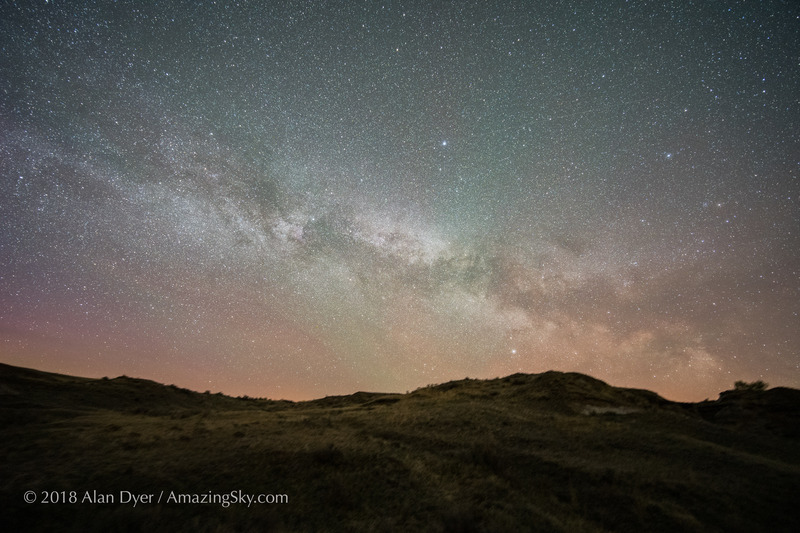 MILKY WAY and PLANETS With the Sony a7III and Laowa 15mm lens at f/2 for a stack of 4 exposures for the ground to smooth noise and one exposure for the sky, all 30 seconds at ISO 3200. 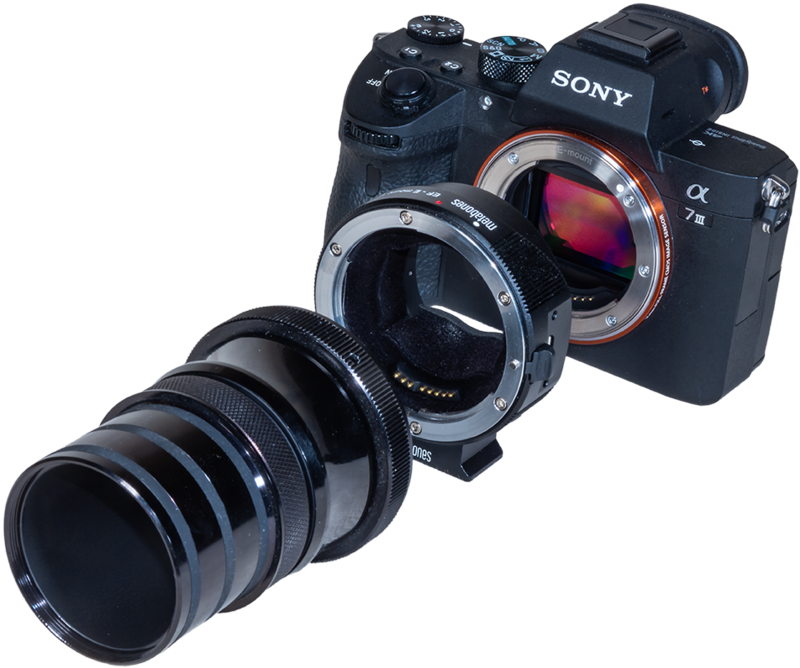 As versatile as a mirrorless camera is for lens choice, making use of that versatility requires buying the right lens adapter(s). They can cost anywhere from $100 to $400. The lowest cost units just adapt the lens mechanically; the more costly units also transfer lens data and allow auto focusing with varying degrees of compatibility. 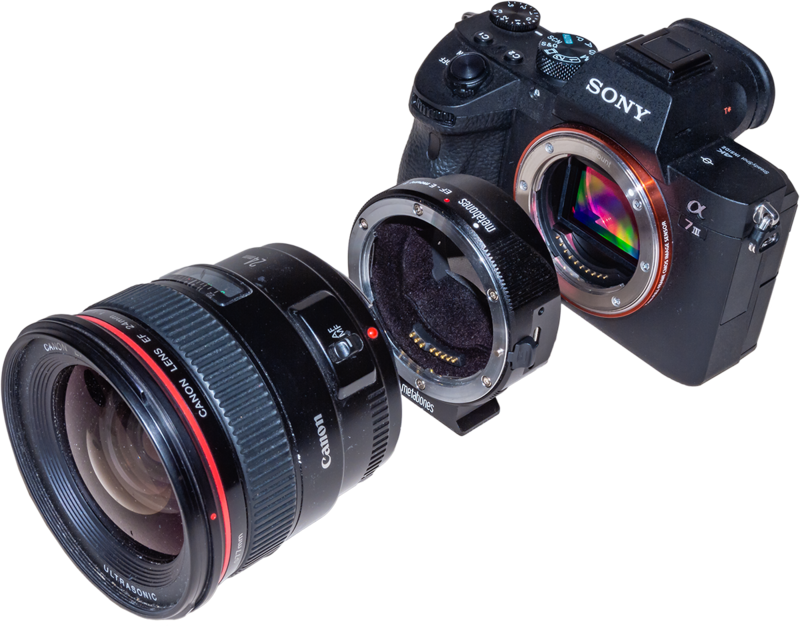 The MetaBones Canon EF-to-Sony E mount adapter transfers lens data and allows auto focus to function. 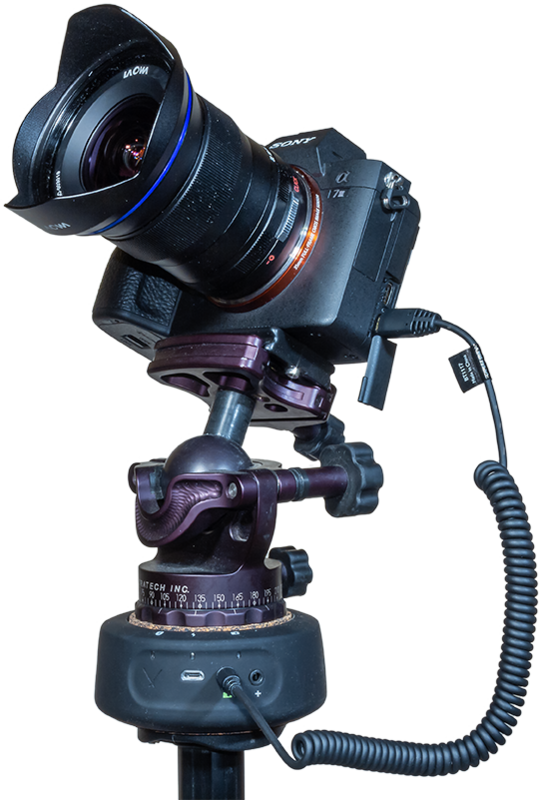 For use on telescopes, the simple adapters will be sufficient, and necessary as many telescope-to-camera adapters and field flatteners are optimized for the longer lens flange-to-sensor distance of a DSLR. Even if you could get a mirrorless camera to focus without a lens adapter to add the extra spacing, the image quality across the field might be compromised on many telescopes. I used the Metabones Canon-to-Sony adapter when attaching the Sony to my telescopes using my existing Canon telescope adapters. Image quality was just fine. The MetaBones adapter, as will other brands, adds the correct lens flange to sensor distance for telescope field flatteners to work best. 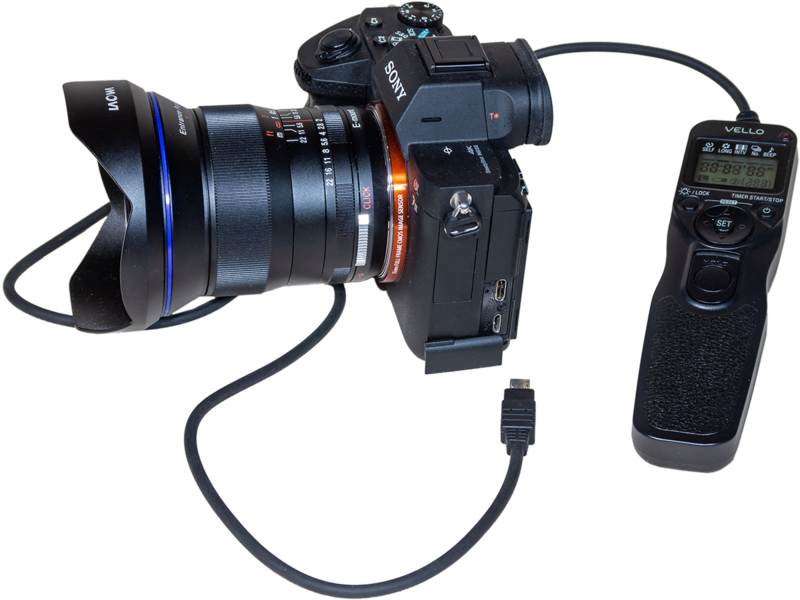 Due to limitations set by Sony, controlling one of their cameras with an external controller can be problematic. Devices that trigger only the shutter should be fine. That includes simple intervalometers like the Vello, the Syrp Genie Mini panning unit, and the Dynamic Perception and Rhino sliders, to name devices I use. However, all will need the right camera control cable, available from suppliers like B&H. And, as I found, the Sony might need to be placed into Continuous shooting mode to have the shutter fire with every trigger pulse from the motion controller. When used with the Genie Mini (below) the Sony fired at only every other pulse if it was in Single shot mode, an oddity of Sony’s firmware. 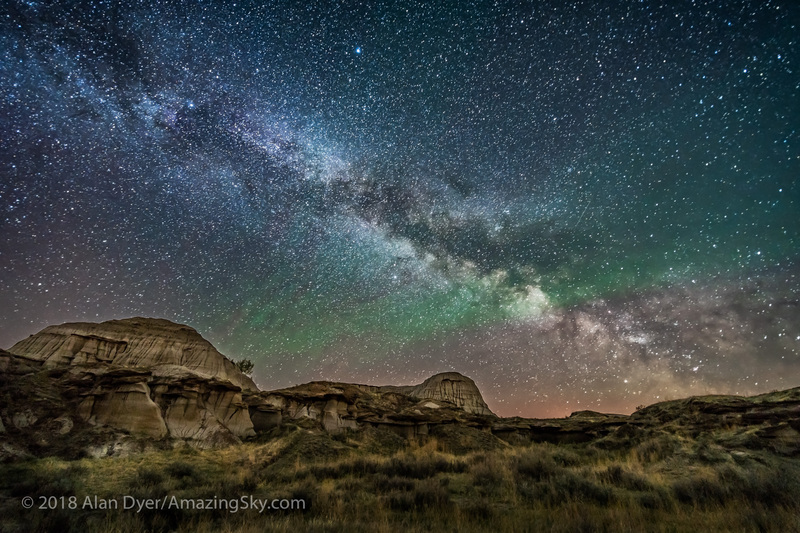 Some time-lapse controllers are able to connect to a camera through its USB port and then adjust the ISO and aperture as well, for ramped “holy grail” sunset-to-Milky Way sequences. The Sony A7III worked well with the Syrp Genie Mini motion controller with the right shutter cable but only when placed in Continuous mode. In conclusion, here’s my summary recommendations for the three competitive cameras, rating them from Poor, to Fair, to Good, to Excellent. 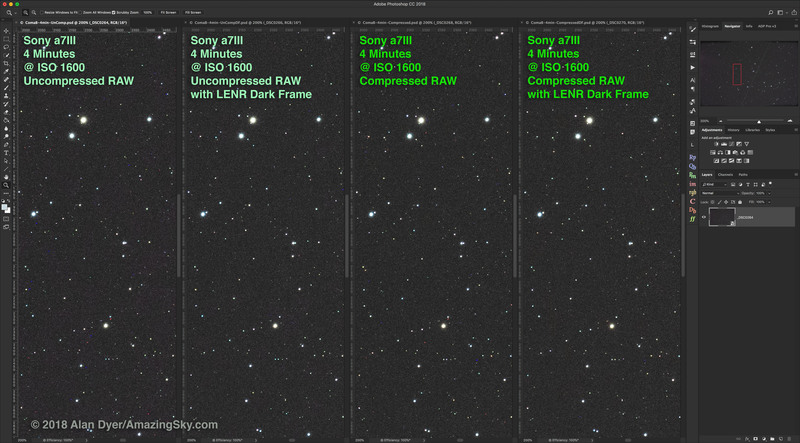 SONY: I deducted marks from the Sony a7III for deep-sky imaging for its lack of a light frame buffer, poor red sensitivity, odd LENR performance, and purple amp glow not seen on the other cameras and that dark frames did not eliminate. However, I did not consider “star eating” to be a negative factor, as the Sony showed just as many stars and as well-resolved as did the competitors, and what more could you ask for? 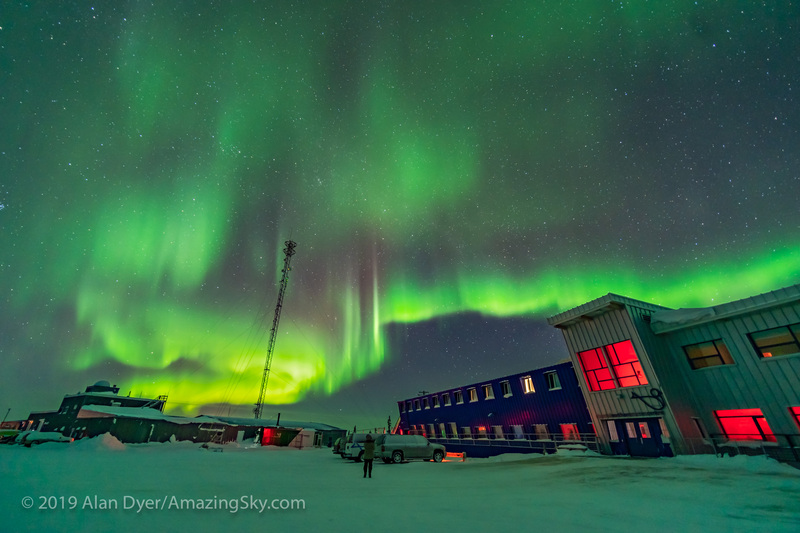 I rate the Sony excellent for nightscape imaging and for real-time aurora videos. I list it as just “good” for time-lapse work only because it will not be fully compatible with some motion controllers and rampers. So beware! NIKON: I deducted points for real-time video of auroras – the D750 can do them but is pretty noisy with the high ISOs needed. Its red sensitivity is not bad, but its lack of a light frame buffer results a less productive imaging cycle when using LENR on deep-sky shooting. I know … people shoot dark frames separately for subtracting later in processing. However, I’ve found these post-shoot darks rarely work well, as the dark frames are not at the same temperature as the light frames, and often add noise or dark holes. While the 6D MkII has HD video, it is incapable of any low-light video work. 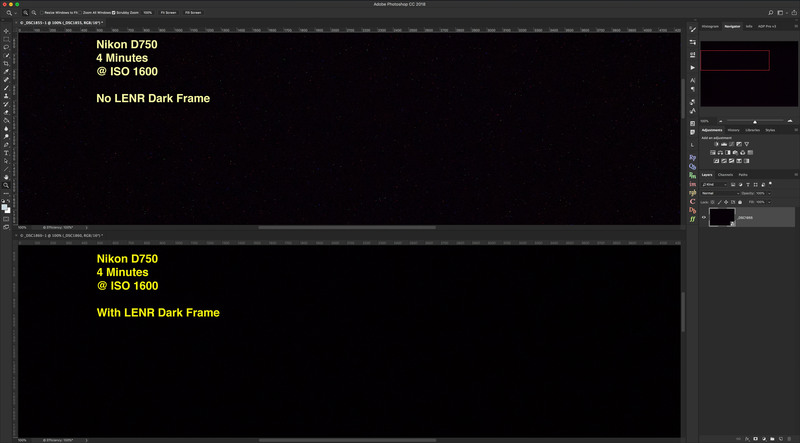 And its light-frame buffer is great for minimizing shooting time for a series of deep-sky images with in-camera LENR dark frames, which I find are the best for minimizing thermal noise. Give me a Canon full-frame any day for prime-focus deep-sky shooting. 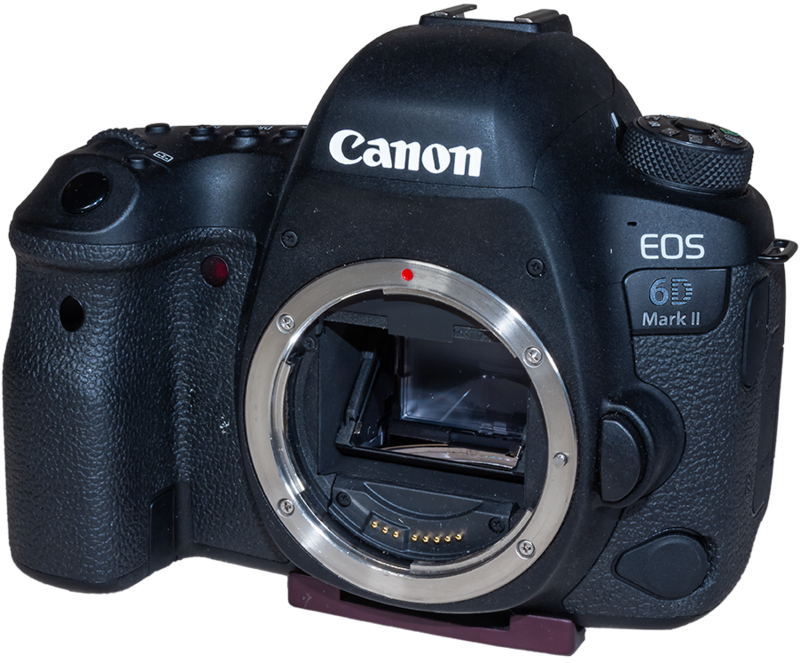 It’s just a pity the 6D MkII has only a 3-frame buffer when using LENR. Really Canon? The 2008-vintage 5D MkII had a 5-frame buffer! Your cameras are getting worse for astrophotography while Sony’s are getting better. I trust you’ll find the review of value. Thanks for reading! The Sony would perform better for noise under dark sky conditions, at high ISOs, rather than the moonlit scene above. OK, let’s try that. The Sony would perform better in an ISO Invariancy “face-off” if its ISOs were kept above 640, to keep all the images within the Sony’s upper ISO range of its dual-gain sensor design, with two ranges (100 to 400, and 640 on up). Fair enough. What little “star-eater” effect I saw might be mitigated by shooting on Continuous drive mode or by firing the shutter with an external timer. That’s worth a check, too. 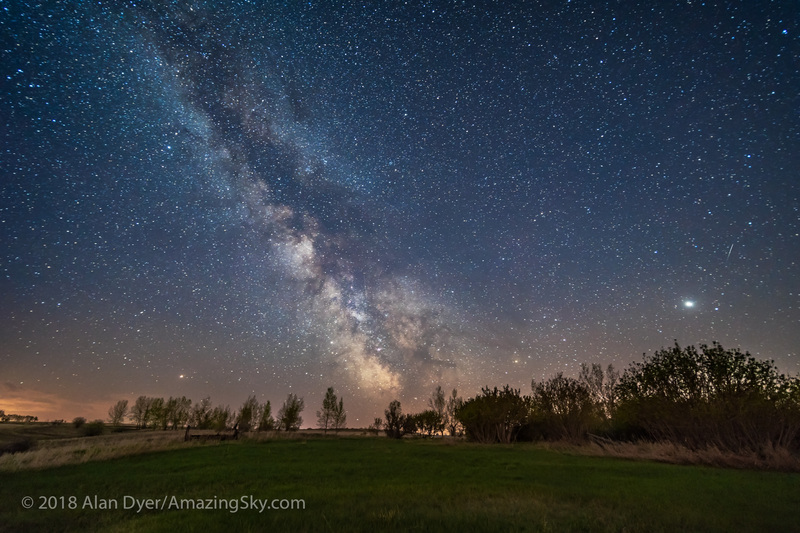 For the additional tests, I shot all images within a 3-hour span on the night of June 5/6, using the Sony a7III, Nikon D750, and Canon 6D MkII, with the respective lenses: the Laowa 15mm lens at f/2, the Sigma 14mm Art at f/2, and the Rokinon 14mm SP at f/2.5. The cameras were on a Star Adventurer Mini tracker to keep stars pinpoints, though the ground blurred in the longer exposures. I show only the Sony and Nikon compared here, shot at the common range of ISOs used for nightscape shooting, 800 to 12800. All images are equally well exposed. The inset image at right in Photoshop shows the scene, the Milky Way above dark trees in my backyard! To the eye, the Sony and Nikon look very similar for noise levels, just as in the moonlit scene. Both are very good – indeed, among the best performing cameras for high-ISO noise levels. But the Sony, being four years newer than the Nikon, is not better. BUT … what the Sony did exhibit was better details in the shadows than the Nikon. And this was with equal processing and no application of Shadow Recovery. This is where the Sony’s Backside Illuminated sensor with presumably higher quantum efficiency in gathering photons might be providing the advantage. With its good shadow details, you have to apply less shadow recovery in post-processing, which does keep noise down. So points to Sony here. Noise levels appeared visually similar but the Sony showed more shadow details. Excellent! 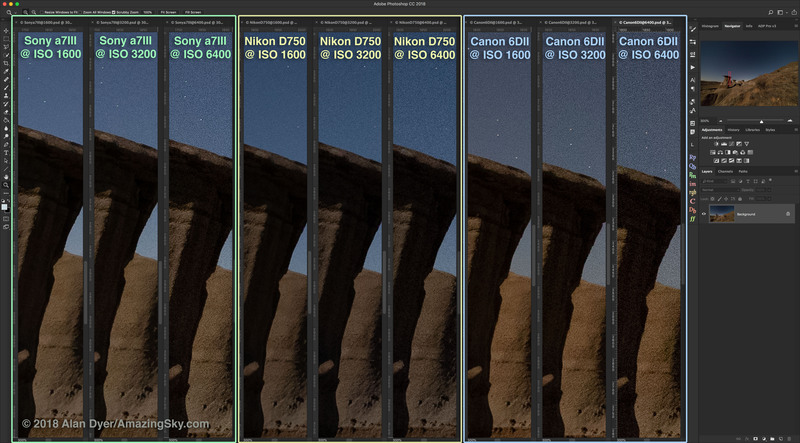 I did put all the high ISO images through the classic noise reduction program Noise Ninja to measure total Luminance and Chrominance noise, and included the Canon 6D MkII’s images. 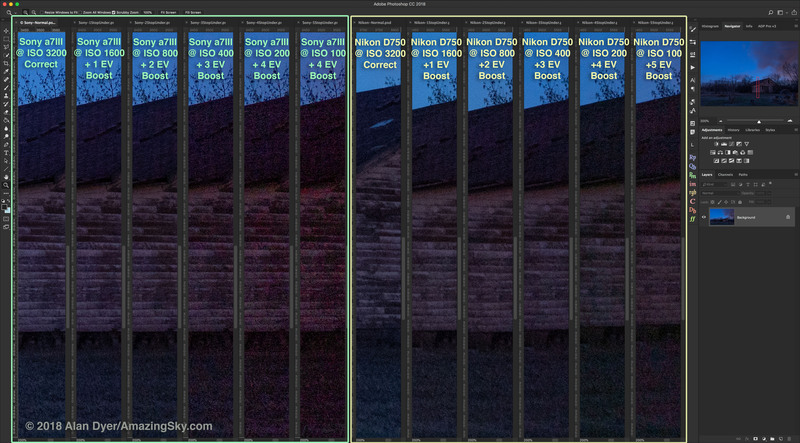 The resulting values and graph show the Sony actually measured worse for noise than the Nikon at each high ISO speed, 3200 to 12800, though with both performing much better than the Canon. 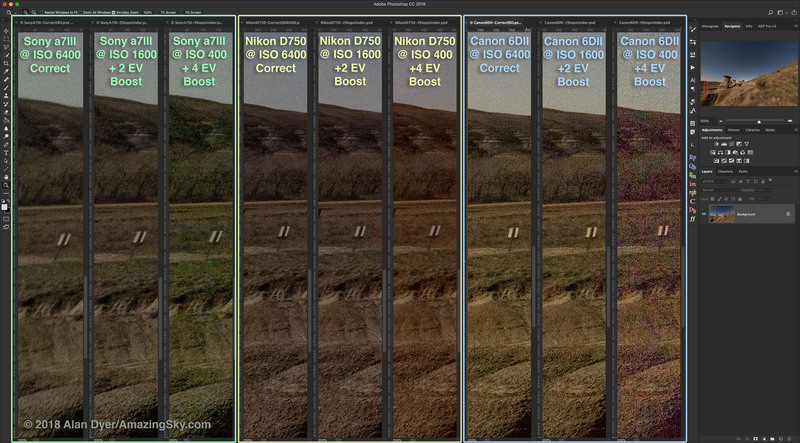 The higher noise of the Canon is visually obvious, but I’d say the Sony a7III and Nikon D750 are pretty equal visually for noise, despite the numbers. Again, here I show only the Sony and Nikon, the two “ISO invariant” cameras. The correct exposure for the scene was 30 seconds at ISO 6400 and f/2. 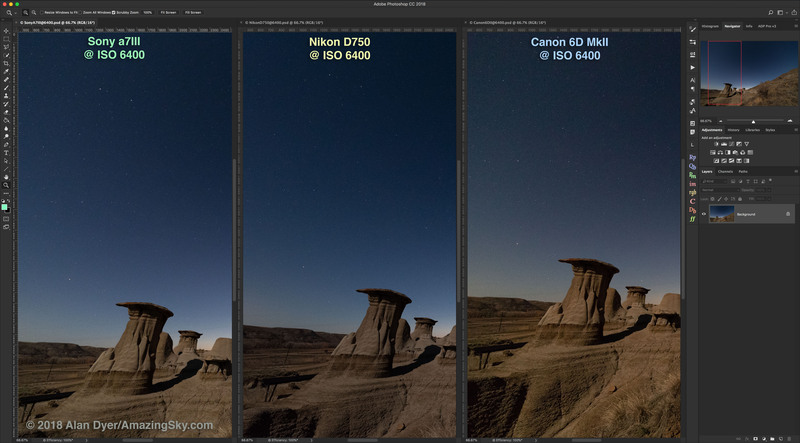 The images shown here were shot at lower ISOs to underexposure the dark scene by 2 to 4 stops or EV. Those underexposed images were then boosted later in processing (in Adobe Camera Raw) by the required Exposure Value to equalize the image brightness. Contrary to expectations, the Sony did not show any great loss in image quality as it crossed the ISO 640 boundary into its lower ISO range. 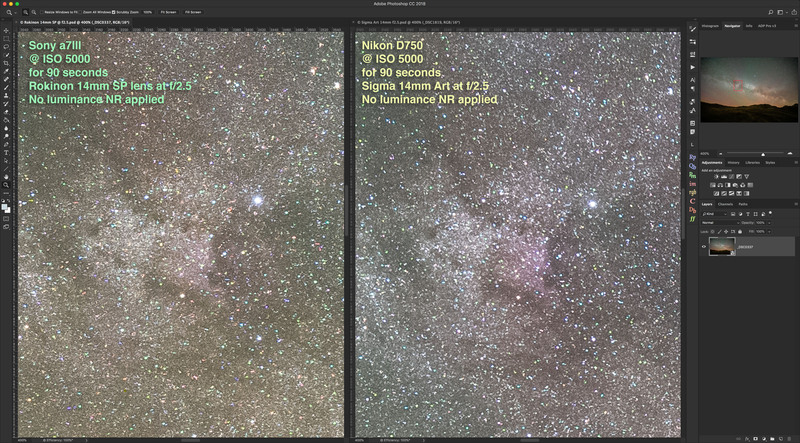 But the Nikon did show more image artifacts in the “odd-numbered” ISOs of 640 and 500. In this test, the Nikon did not perform as well as the Sony for ISO invariancy. Go figure! Again, the differences are in images vastly underexposed. 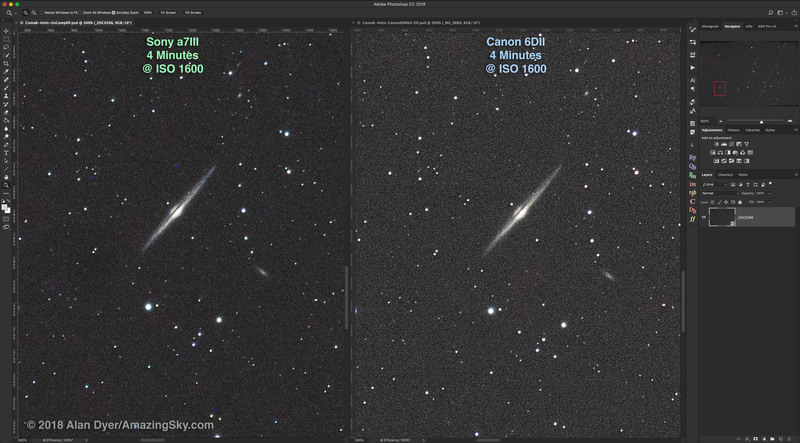 And both cameras performed much better than the ISO “variant” Canon in this test. Here the Sony a7III performed well and better than the Nikon D750. 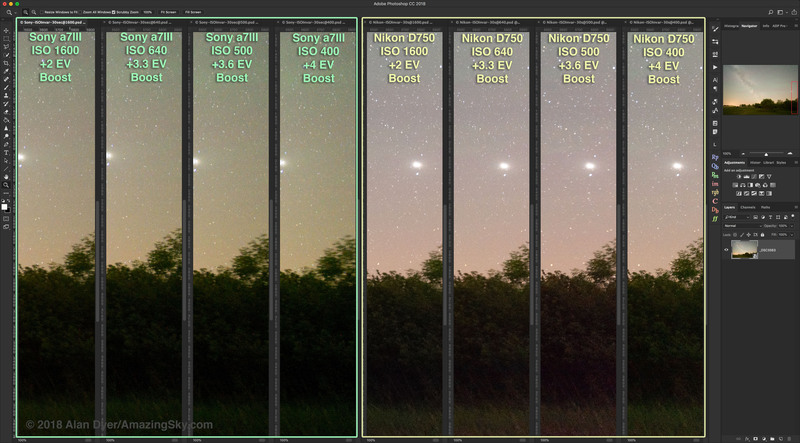 I shot images over a wide-range of exposures, from 2 seconds to 2 minutes, but show only the ones covering the 2-second to 4-second range, where the “star-eater” anti-aliasing or noise smoothing applied by Sony kicks in (above 3.2 seconds it seems). I shot with the Sony a7III on Single shot drive mode, on Continuous Low drive mode (with the camera controlling the shutter speed in both cases), and a set with the Sony on Bulb and the shutter speed set by an external Vello intervalometer. This is really pixel peeping at 400%. In Single drive mode, stars and noise soften ever so slightly at 4 seconds and higher. In Continuous mode, I think the effect is still there but maybe a little less. In shots on Bulb controlled by the External Timer, maybe the stars at 4 seconds are a little sharper still. But this is a tough call. 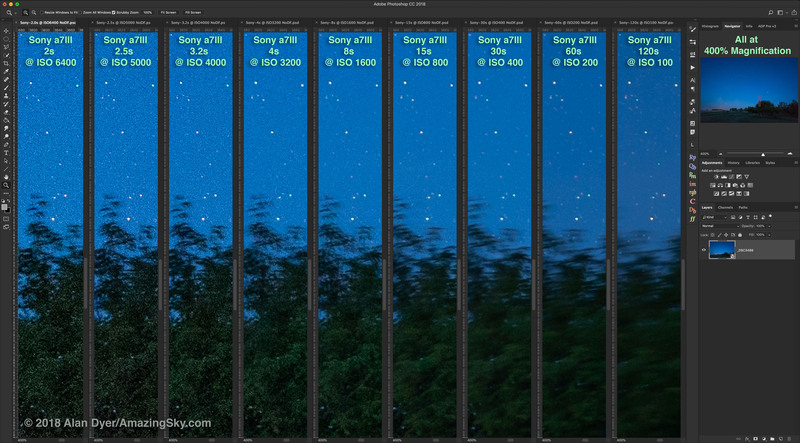 To me, the star eater effect on the Sony a7III is a non-issue. It may be more serious on other Sony alphas. This series shows star sharpness in images taken in Single and Continuous drive modes, and in Externally Timed exposures. An issue that, to me, has a more serious effect on star quality is the propensity of the Sony, and to some extent the Nikon, to render tiny stars as brightly colored points, unrealistically so. In particular, many stars look green, from the dominance of green-filtered photosites on Bayer-array sensors. Here I compare all three cameras for this effect in two-minute tracked exposures taken with Long Exposure Noise Reduction (i.e. in-camera dark frame subtraction) off and on. The Sony shows a lot of green stars with or without LENR. The Nikon seems to discolor stars only when LENR is applied. Why would that be? 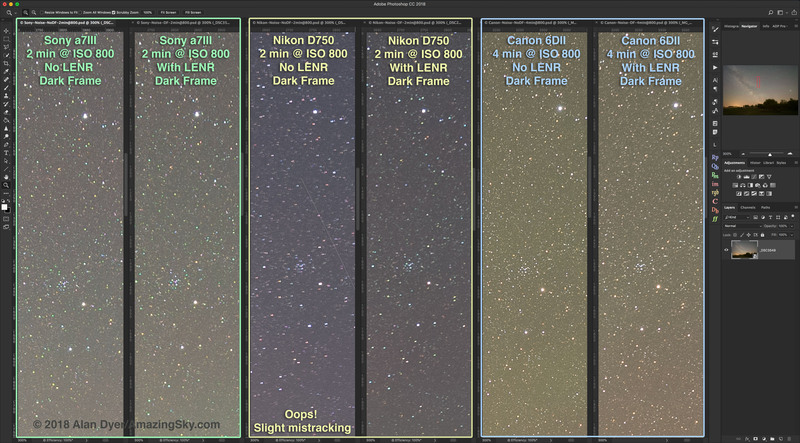 The Canon is free of any such issue – stars are naturally colored whether LENR dark frames are applied or not. This is all with Raws developed with Adobe Camera Raw. 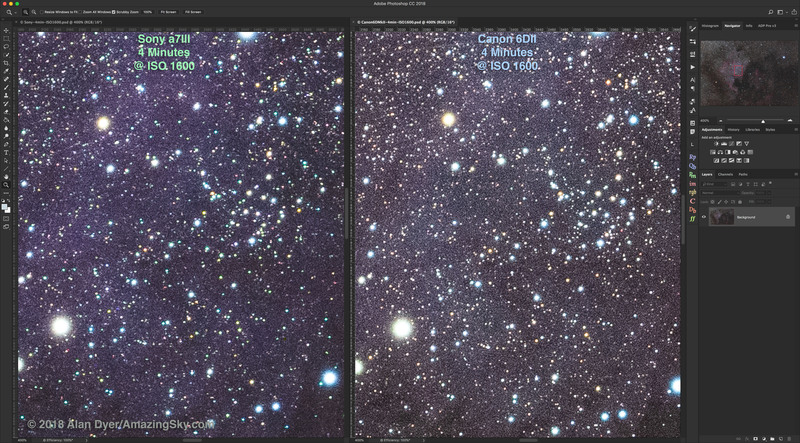 When opening the same Raws in other programs (ON1 Photo RAW, Affinity Photo, DxO PhotoLab, and Raw Therapee) the results can be quite different, with stars often rendered with fringes of hot, colored pixels. Or rendered with little or no color at all. Raw Therapee offers a choice of de-Bayering, or “de-mosaic,” routines, and each produces different looking stars, and none look great! Certainly not as good as the Canon rendered with Camera Raw. What’s going on here is a mystery – it’s a combination of the cameras’ unique Raw file formats, anti-alias filter in front of the sensor (or lack thereof in the Sony), and the de-Bayering routines of all the many Raw developers wrestling with the task of rendering stars that occupy only a few pixels. It’s unfair to blame just the hardware or the software. But this test re-emphasized my thoughts that Canon DSLRs remain the best for long-exposure deep-sky imaging where you can give images as much exposure time as they need, while the ISO invariant Sony and Nikons exceed at nightscape shooting where exposures are often limited and plagued by dark shadows and noise. 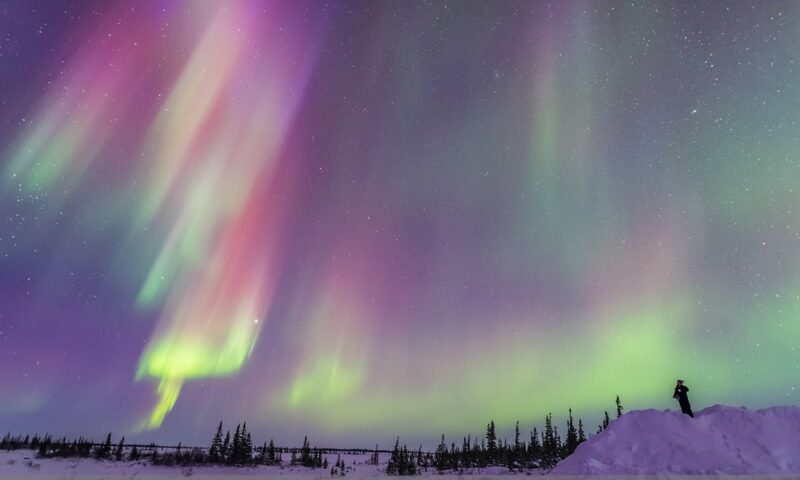 The Sony shows a propensity to render small stars in many vivid and unreal colors. The Nikon can do so after LENR is applied. The Canon is more neutral and natural. I hope you found these latest tests of interest. I present a short video, in 4K, of two video clips of the International Space Station in two successive passages across the sky on May 24/25, 2018. The location was my backyard in southern Alberta. The clips were shot in 4K in real-time video at 24 frames per second but with a 1/4-second shutter speed with a Sony a7III camera, and with 15mm full-frame fish-eye (first clip) and 8mm circular fish-eye lenses. ISO speeds were 6400 and 16,000. The clips are sped up by 2x and 4X in post-production to make a shorter video for the web. The background sounds of the night are real-time and were recorded live with the videos. What I cannot capture is the smell! The lilacs were in bloom and lent a wonderful fragrant scent to the night air, which added to the sights and sounds of a spring night. Thus the title of the video. Much of North America is now enjoying great passes of the ISS. To find out when you can see it from your backyard see NASA’s Spot the Station website and enter your location.